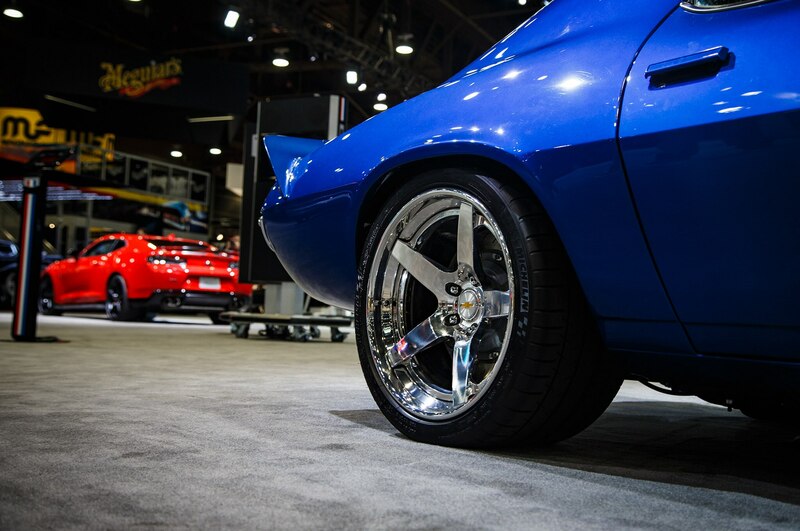 Three breeds of ponycar gracing the stage in Vegas. 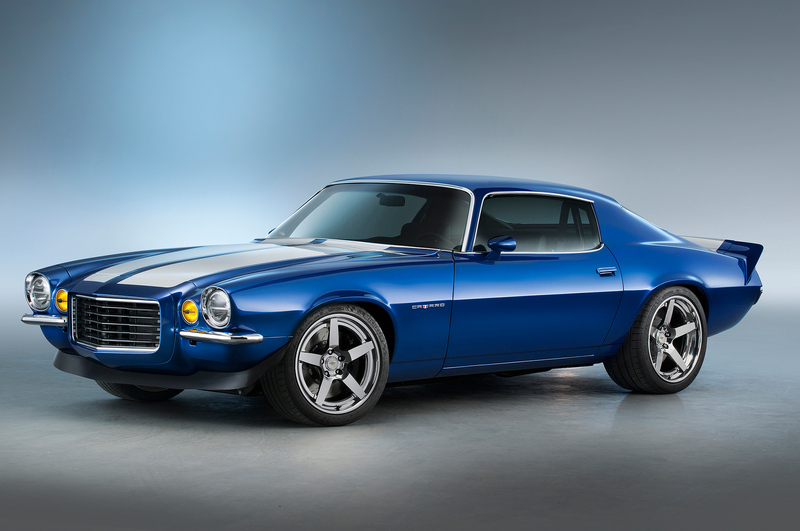 What would you do if you had an engine-less 1970 Chevrolet Camaro RS? 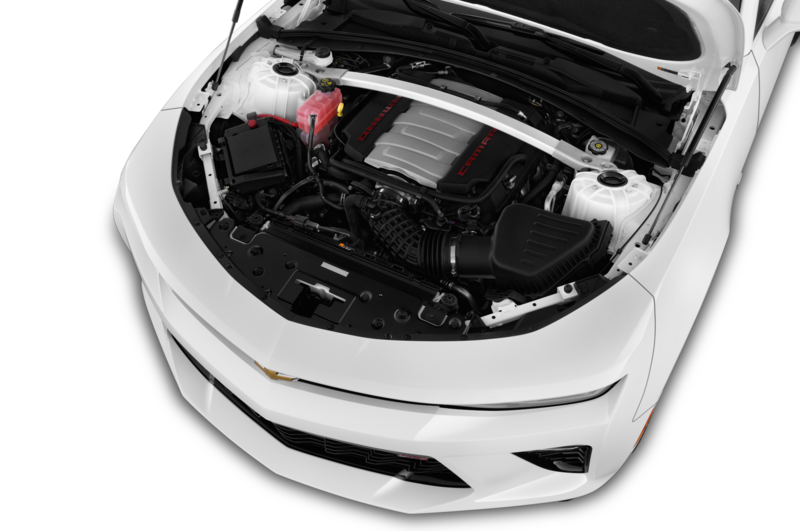 The answer, obviously, is to cram in an LT4 crate engine. 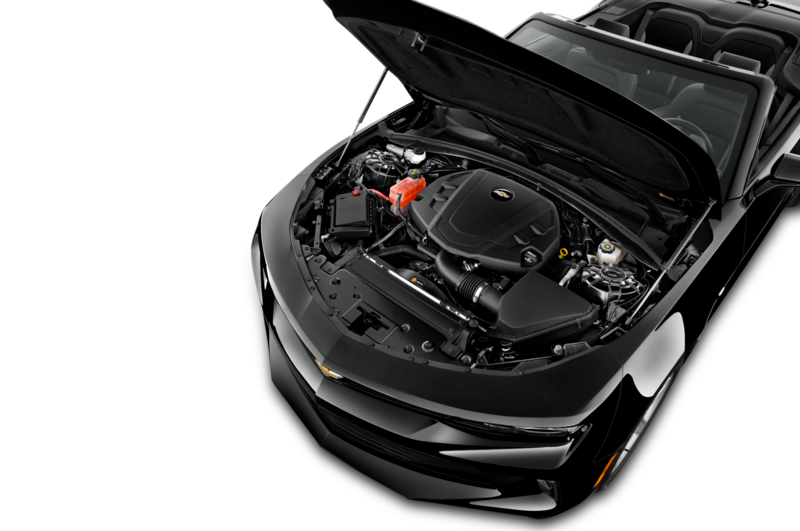 Packing the 650-hp heart of a spankin’ new Corvette Z06, this supercharged classic Chevrolet Camaro uses a wet-sump version of the 6.2-liter V-8. 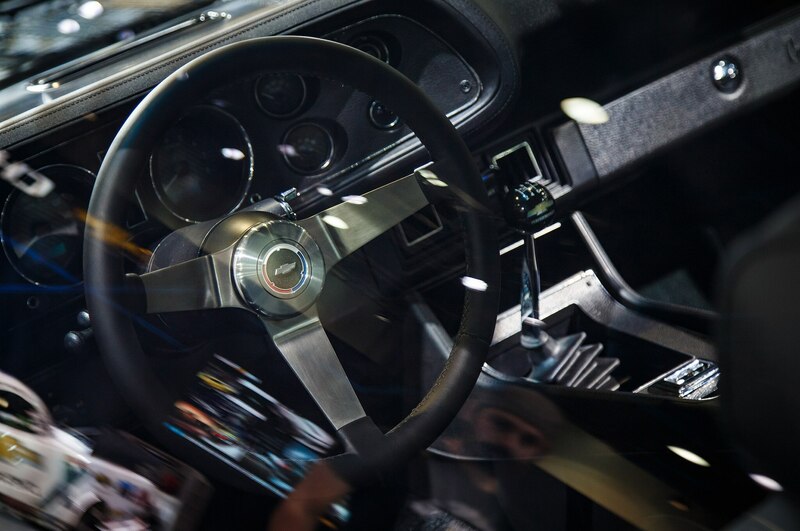 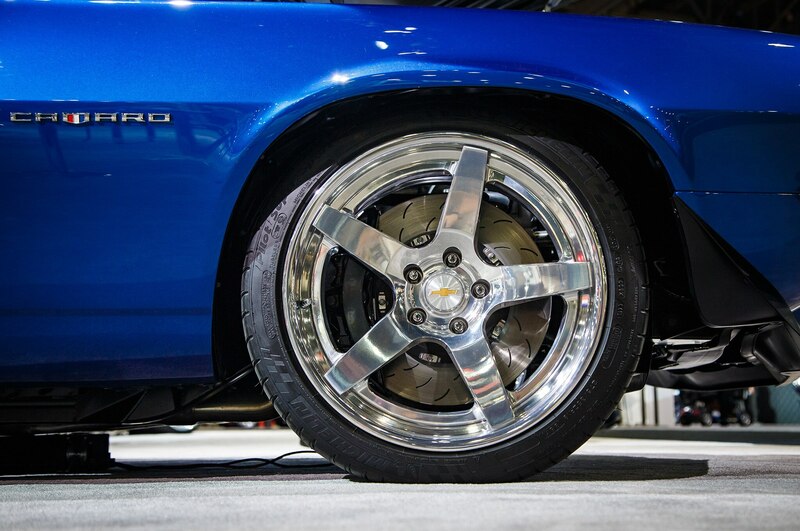 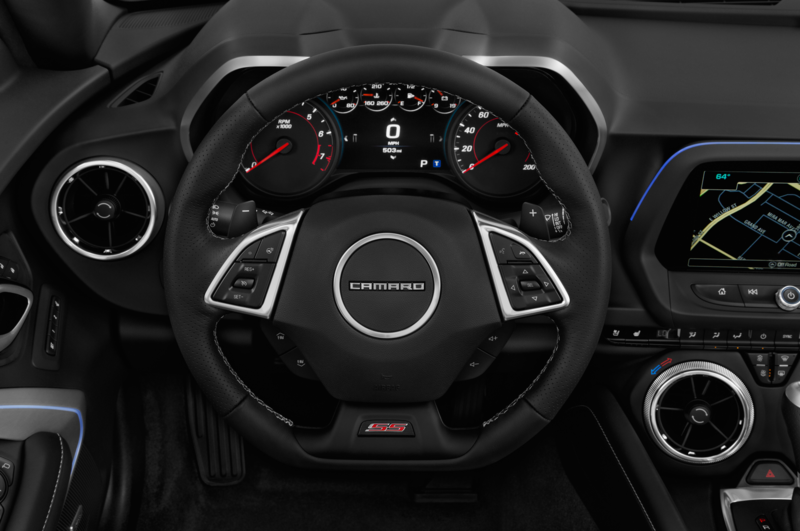 Along with the bristling engine at the core of this resto-mod Camaro, the new(ish) concept features a T-56 Super Magnum six-speed manual transmission, independent front suspension with coilovers, four-link rear suspension with coilovers, rack-and-pinion steering system, 19-inch wheels, and modern Corvette Stingray brakes. 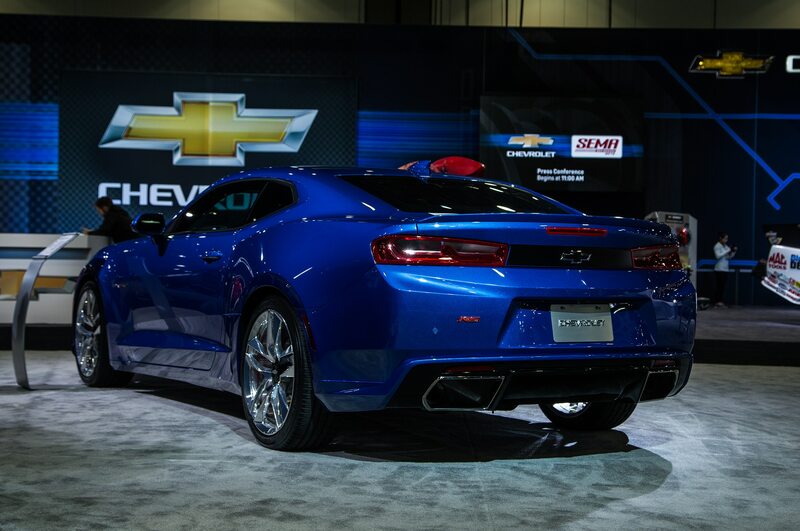 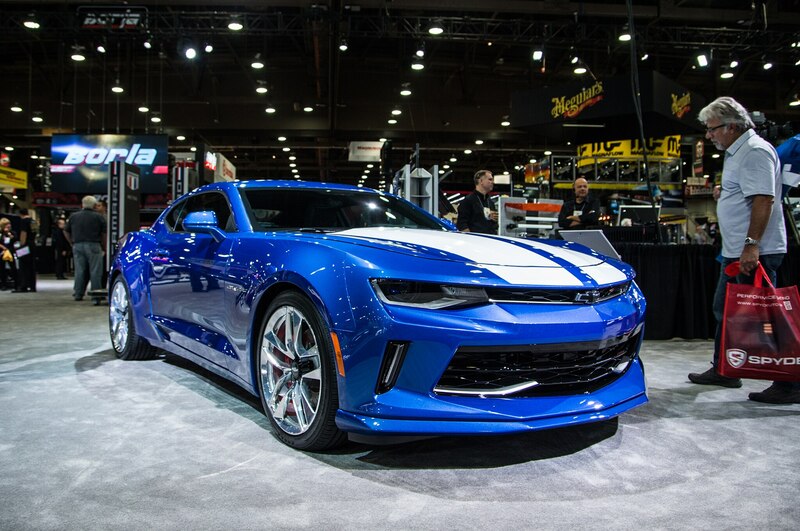 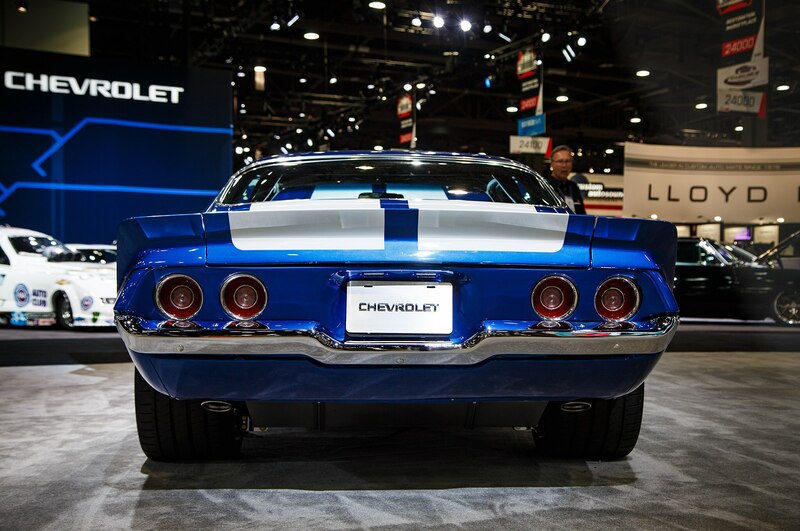 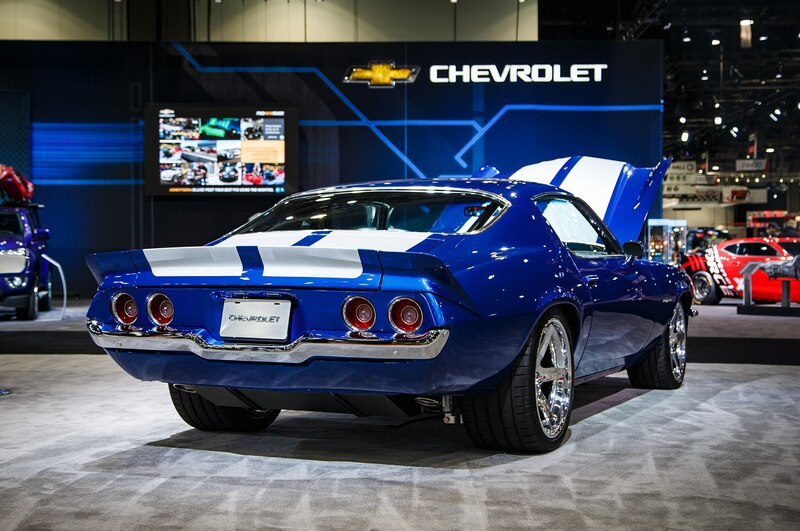 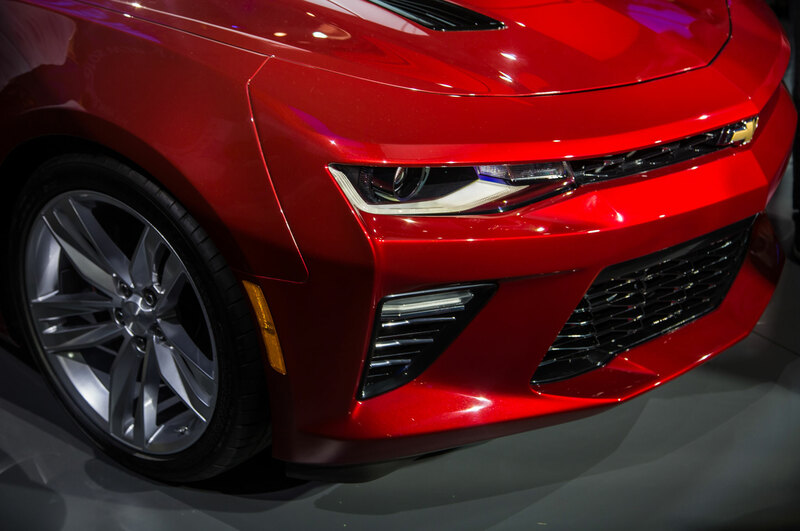 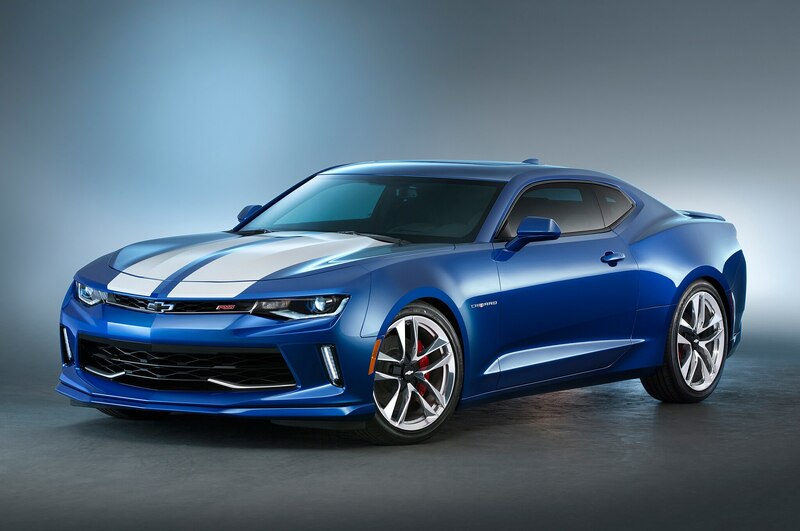 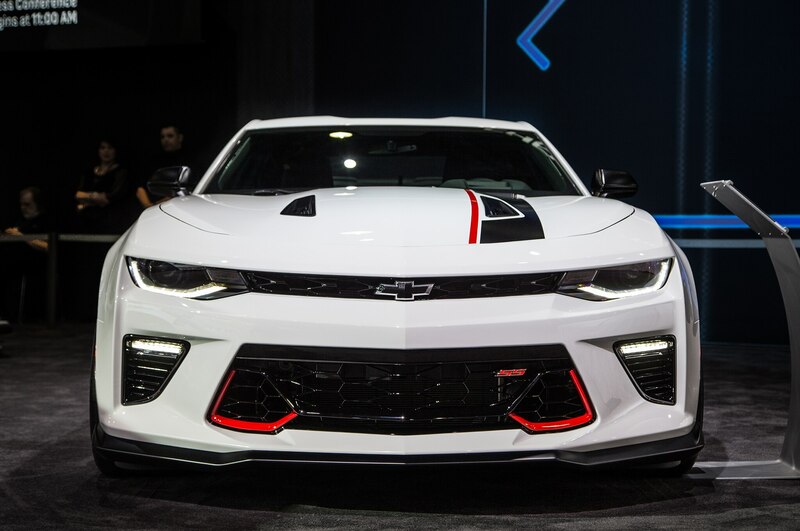 Although the blue paint with white stripes is an old and familiar look, the LT4 Camaro bundles in LED headlamps and taillights for a more modern look. 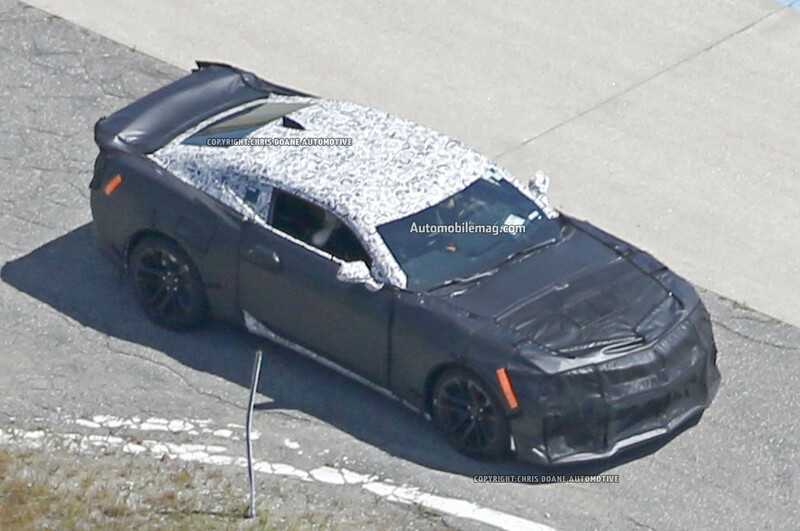 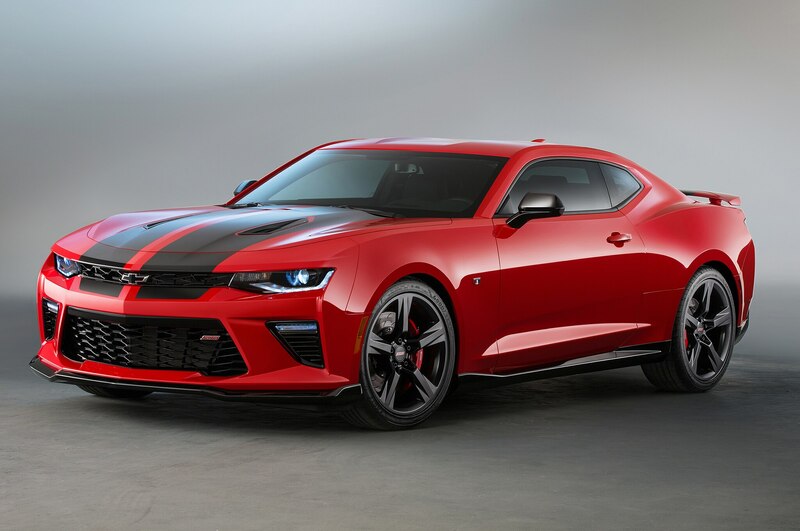 Like COPO Camaros in the past, this sixth-gen COPO Camaro is a mean car, indeed. 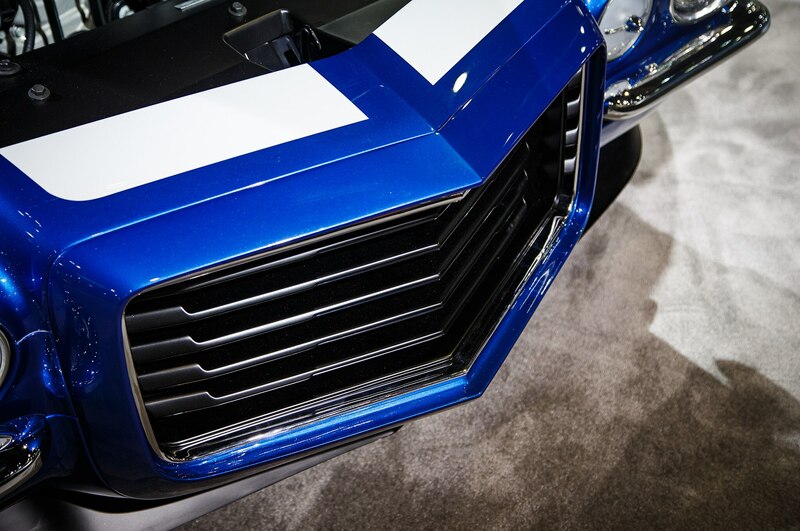 Under the towering carbon fiber hoods lives a concept 350 racing engine topped with a Whipple 2.9-liter supercharger. 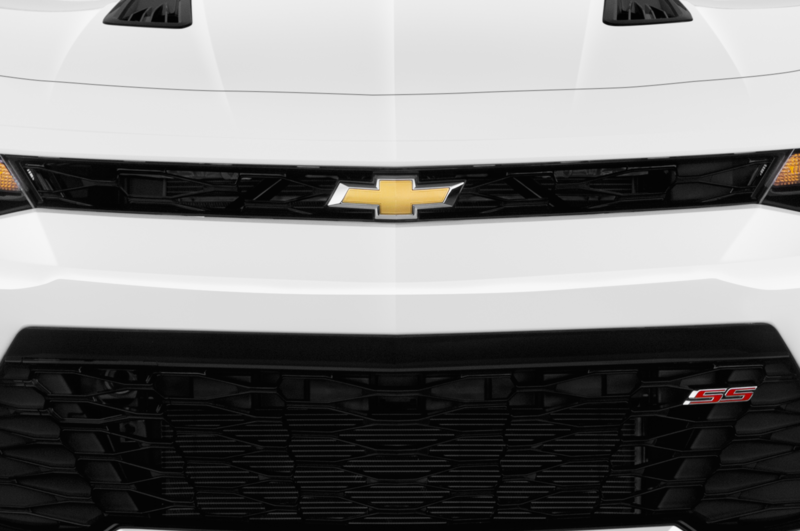 It’ll be poised to launch into orbit when the drag lights go green, thanks to its unique solid-axle rear suspension, lightweight brakes, and unassisted steering. 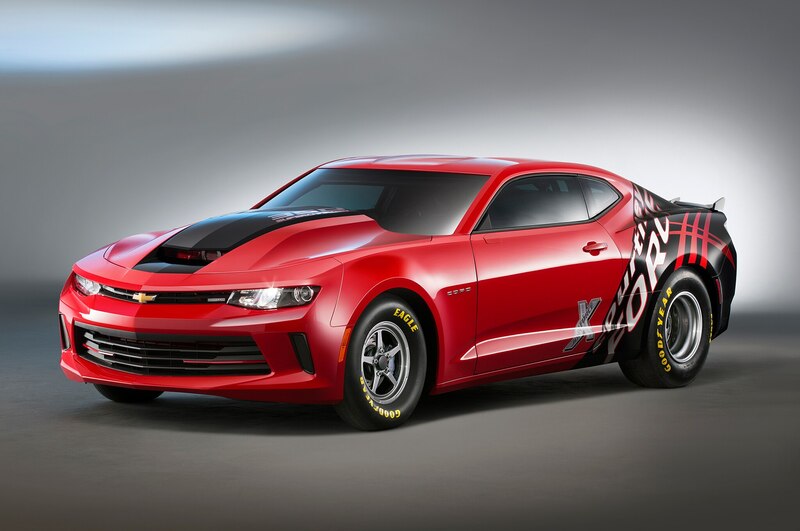 Exterior details such as the Red Hot paint, Courtney Force graphics, Goodyear racing tires, Weld racing wheels, wheelie bars, and parachute let you know this is Camaro is born and bred for the drag strip. 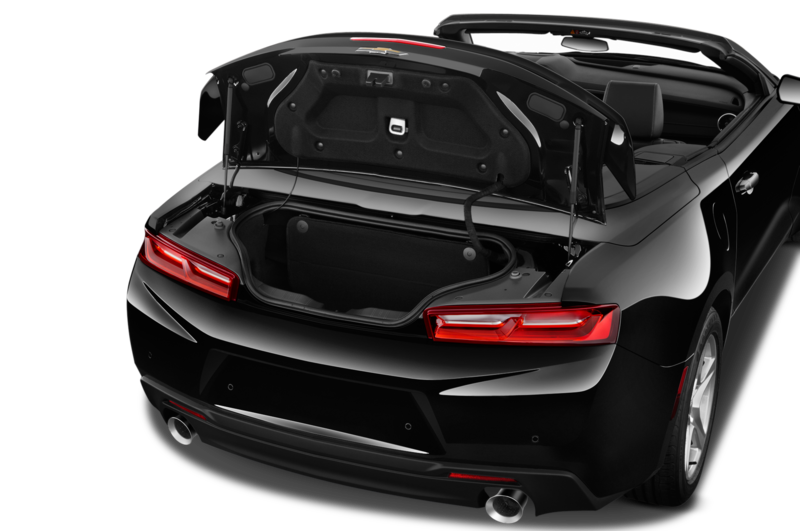 Completing the package inside are a class-certified rollcage. 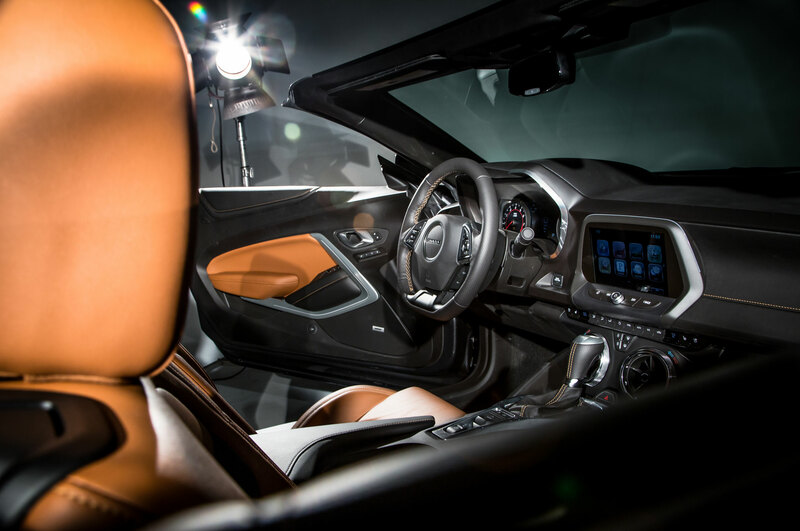 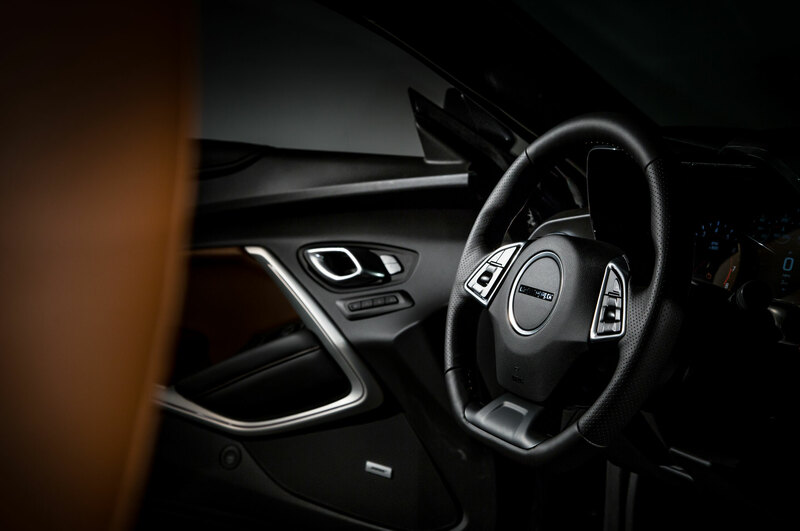 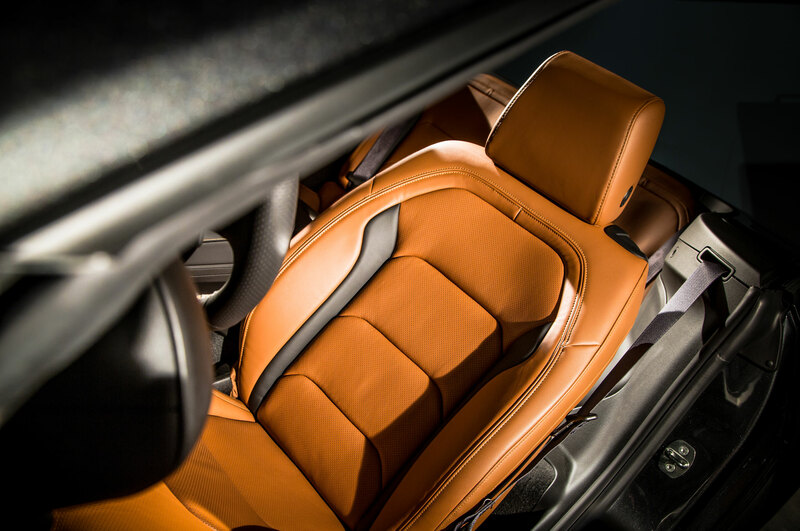 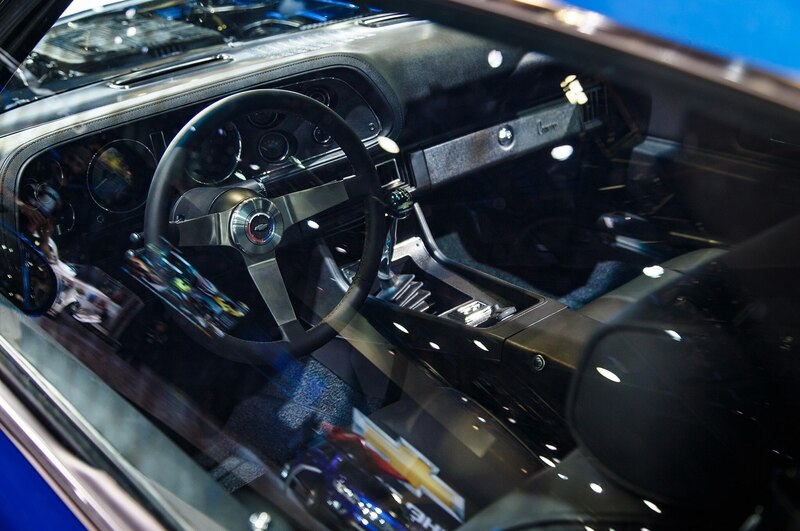 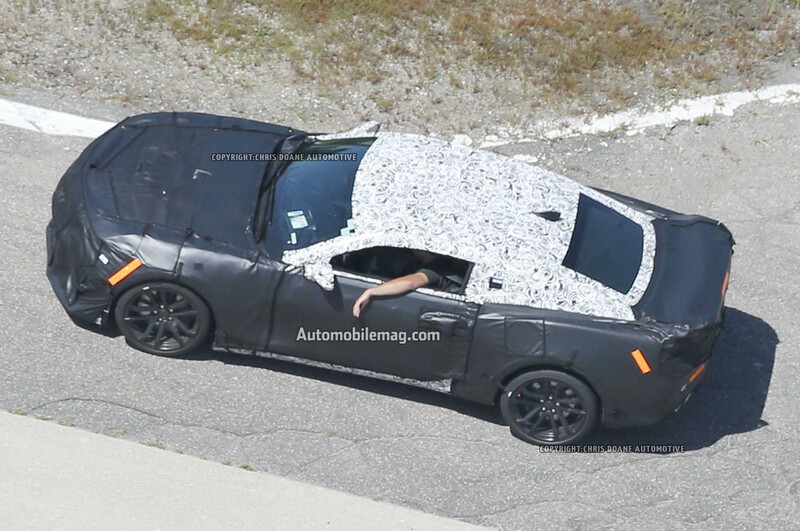 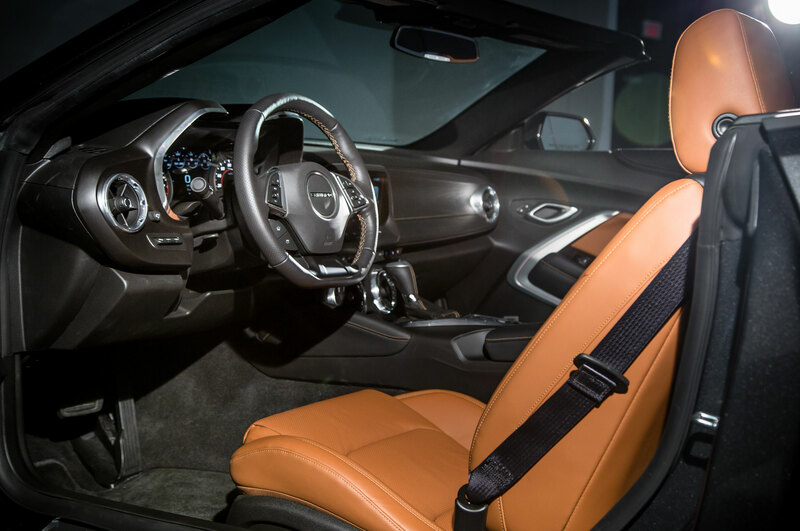 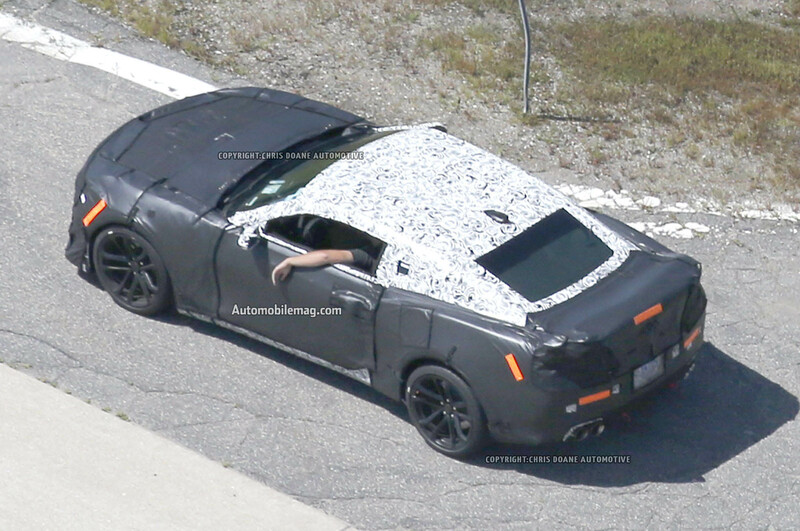 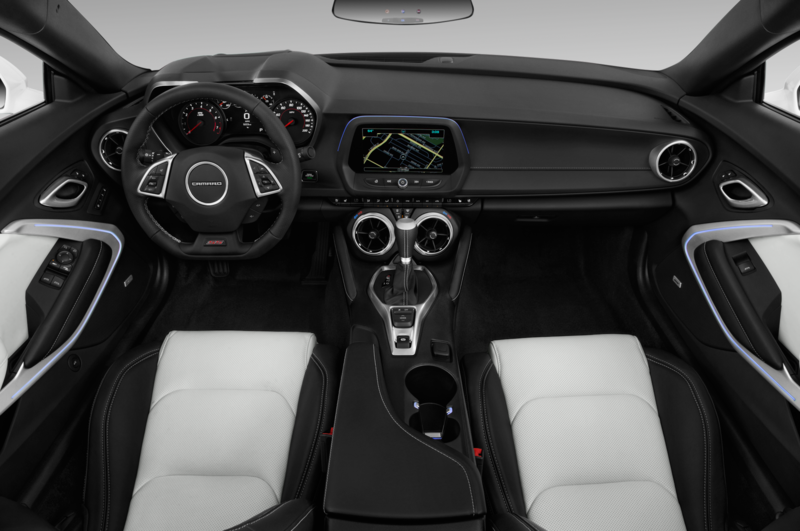 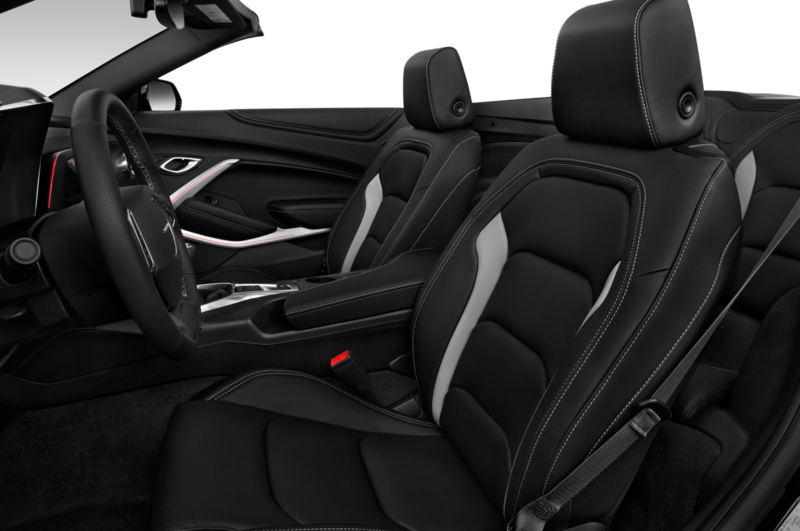 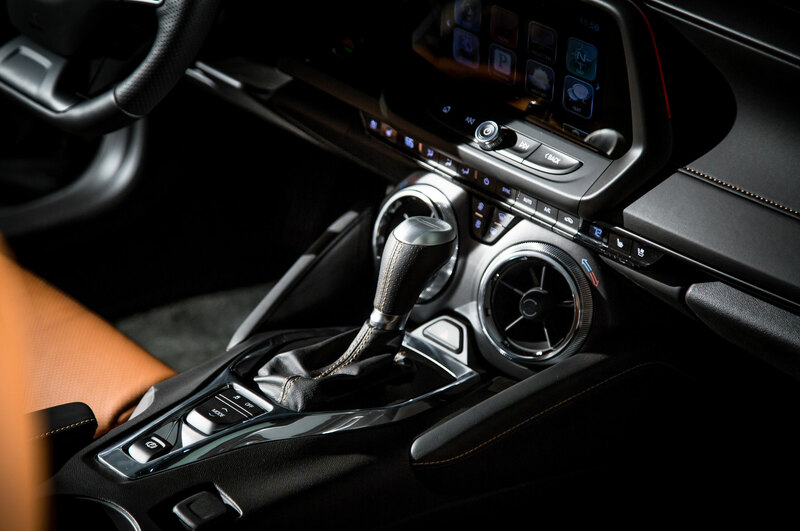 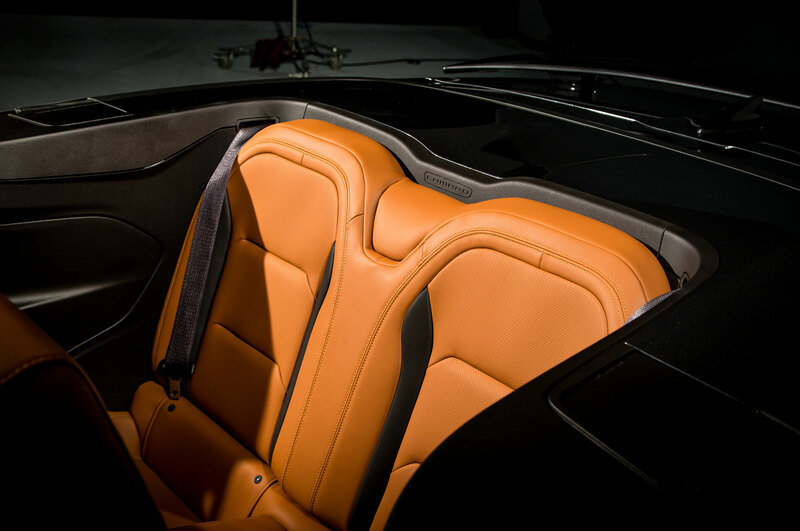 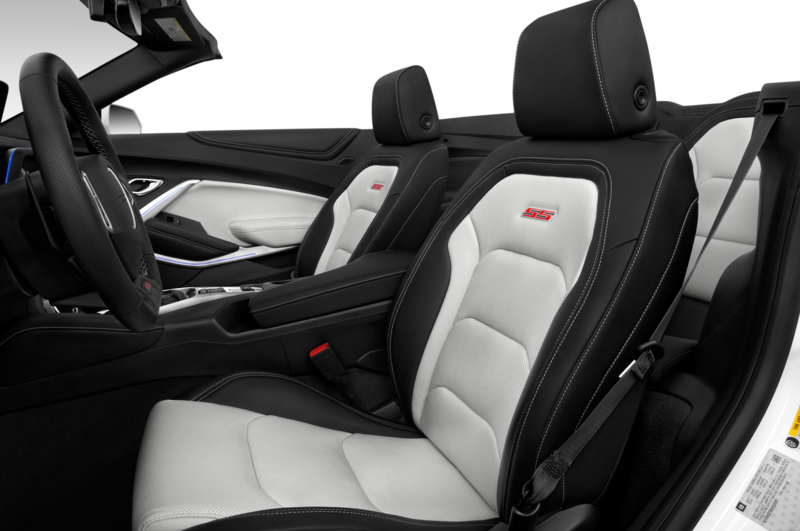 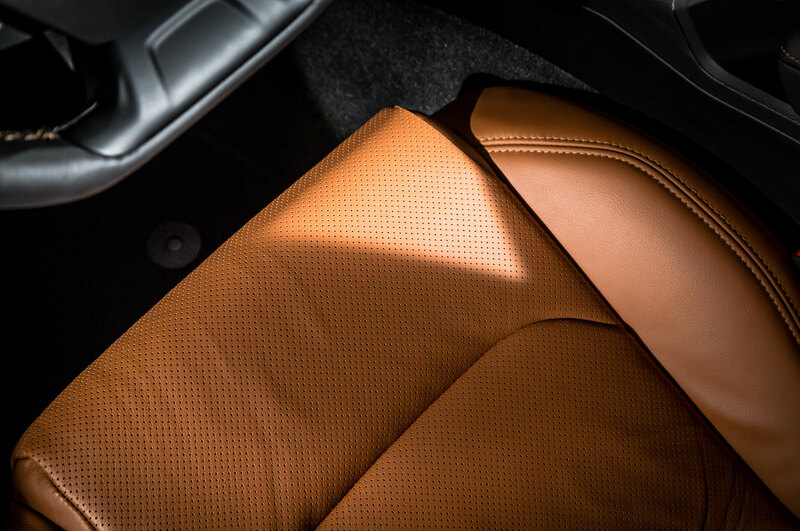 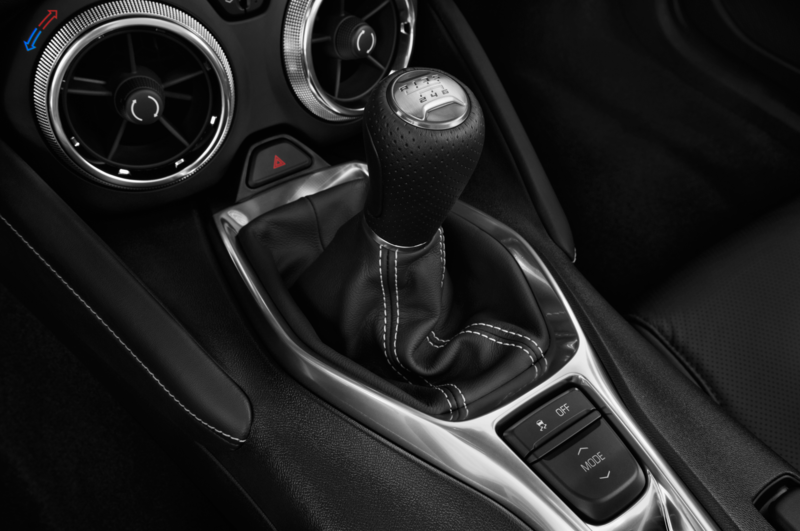 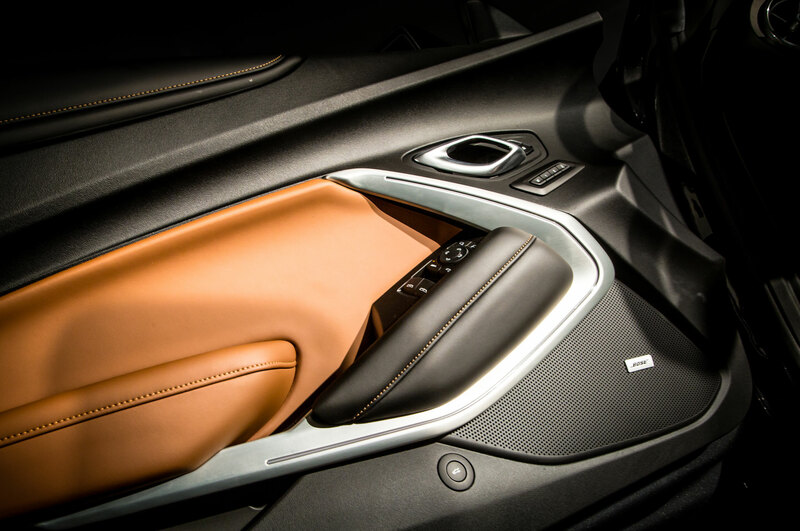 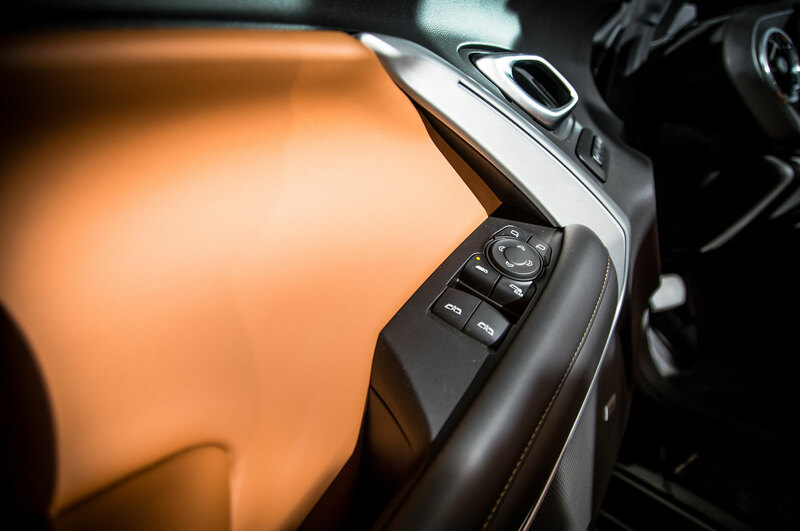 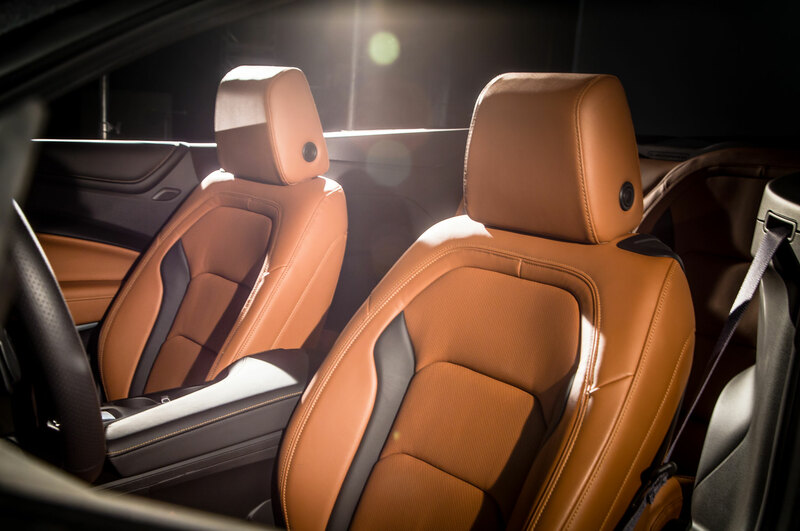 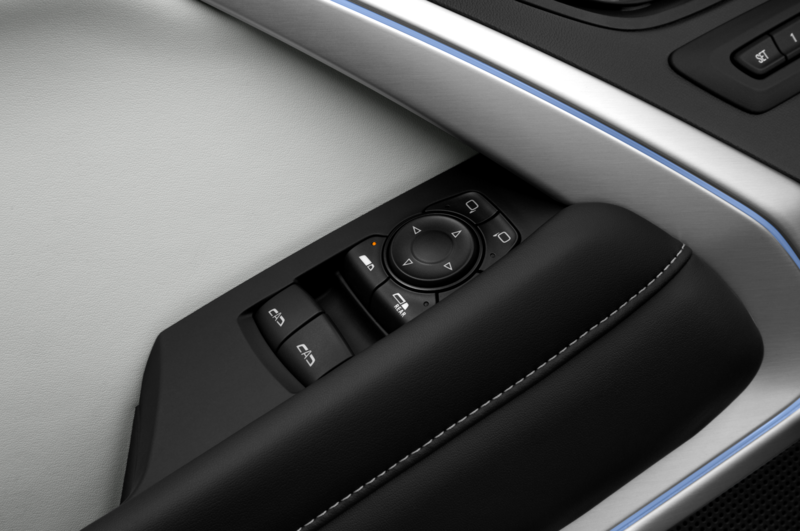 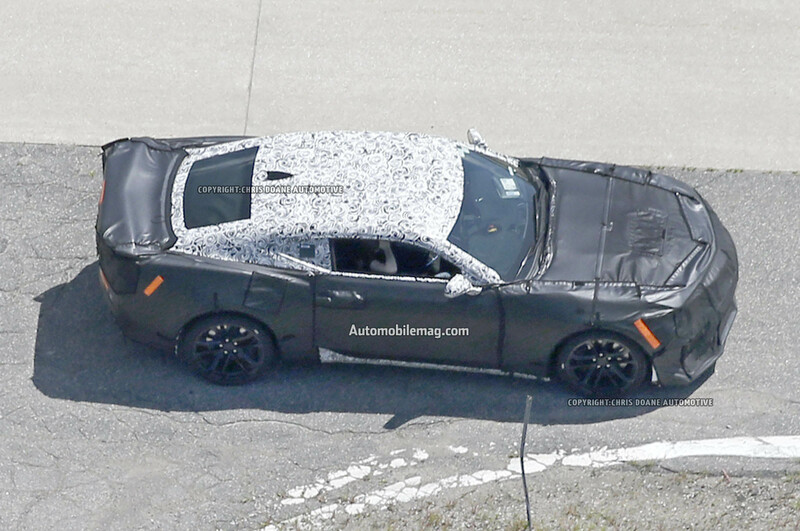 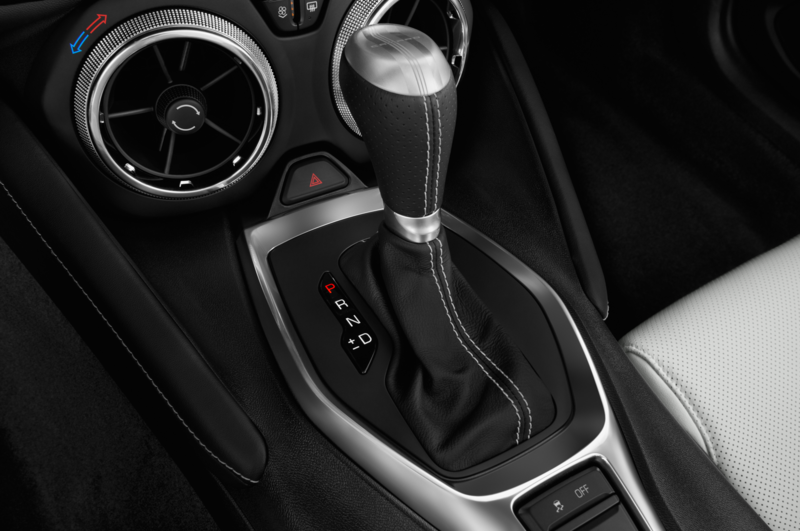 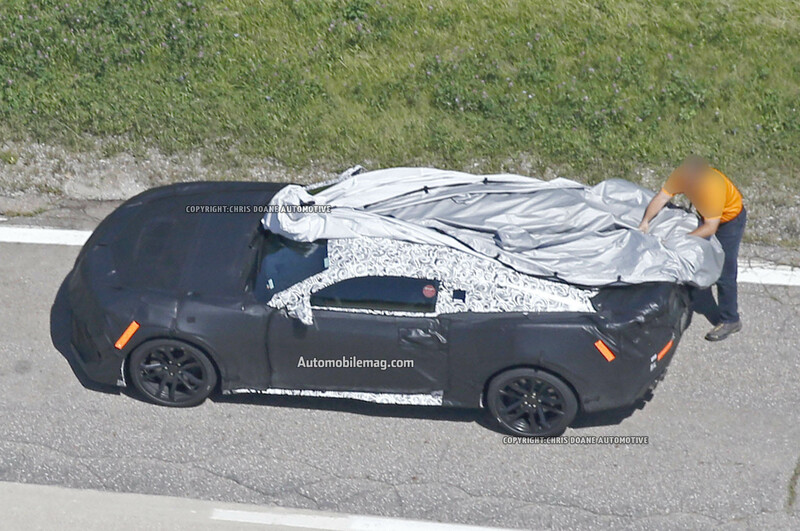 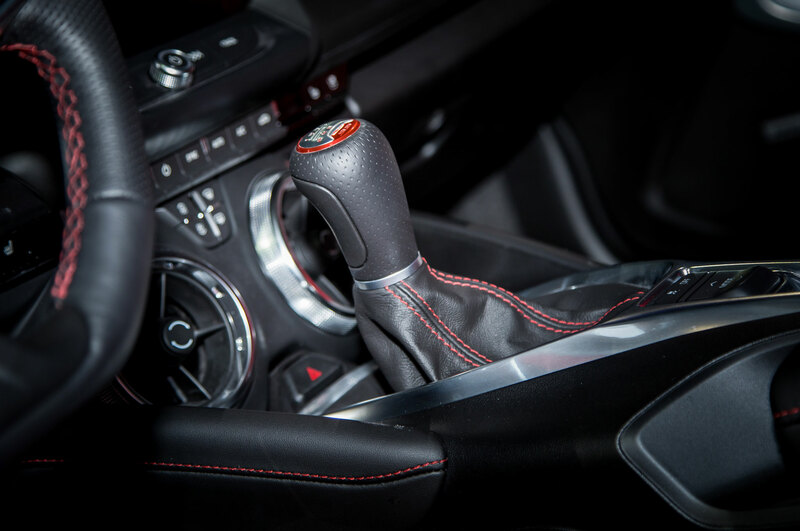 lightweight bucket seats, five-point harnesses, and a floor-mounted shifter. 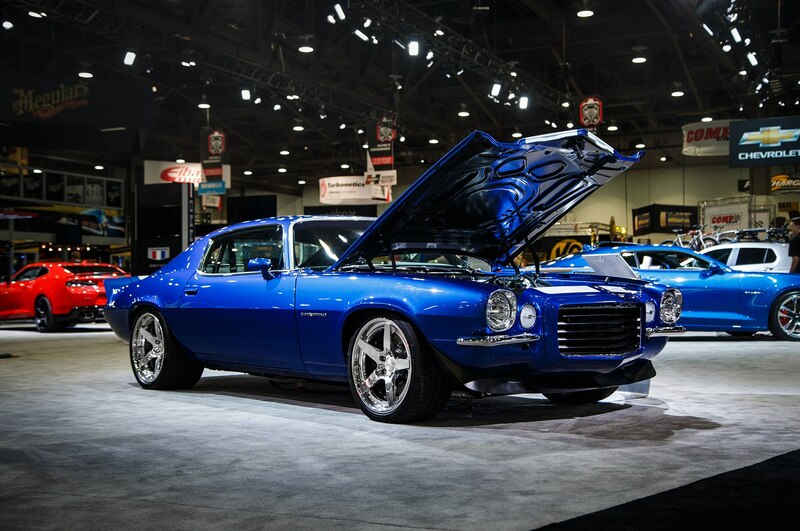 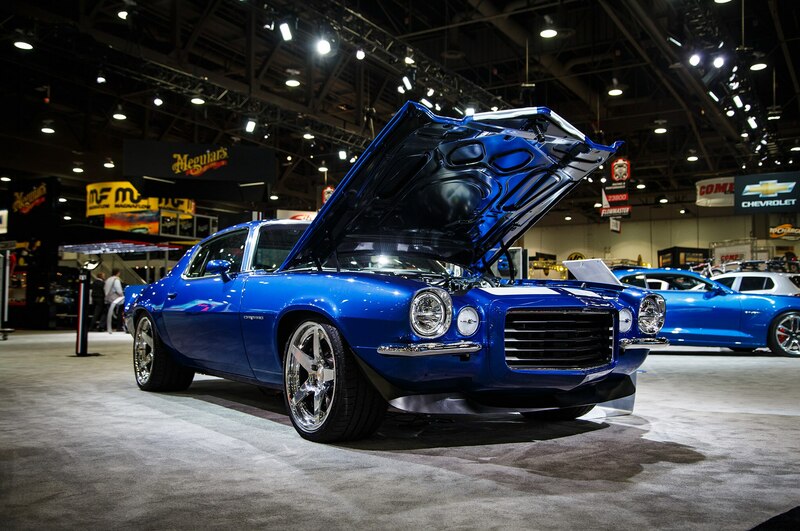 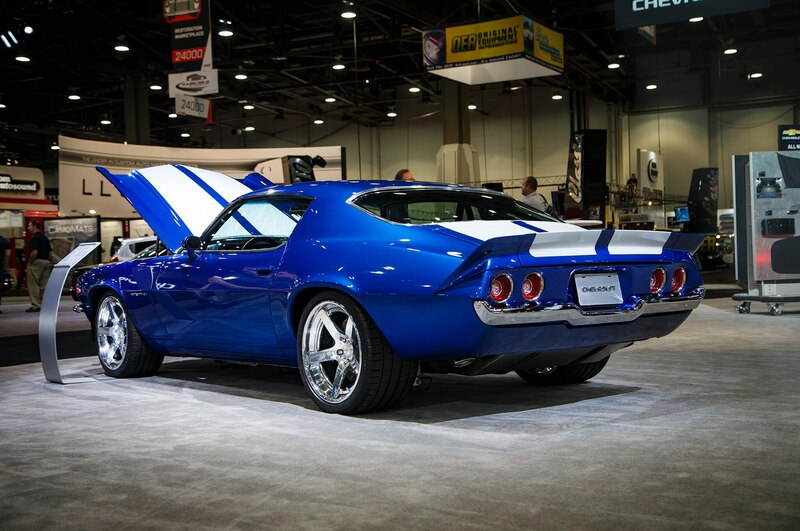 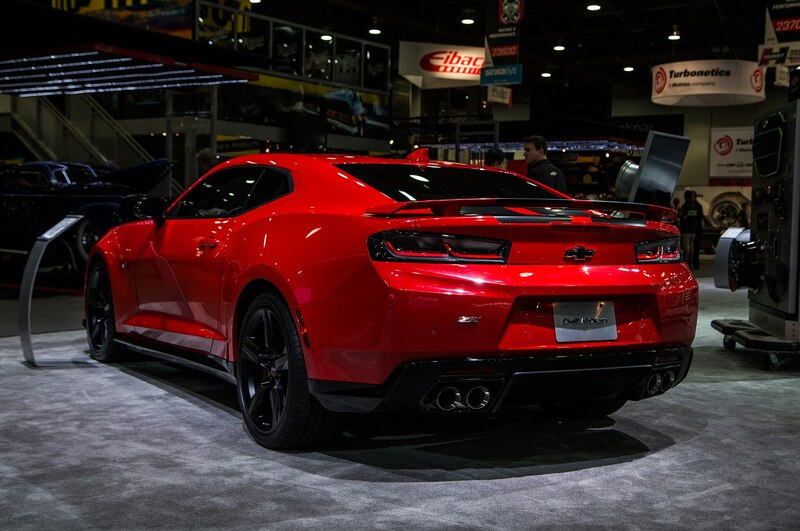 The COPO Camaro will go on sale at the Barrett-Jackson auction early next year. 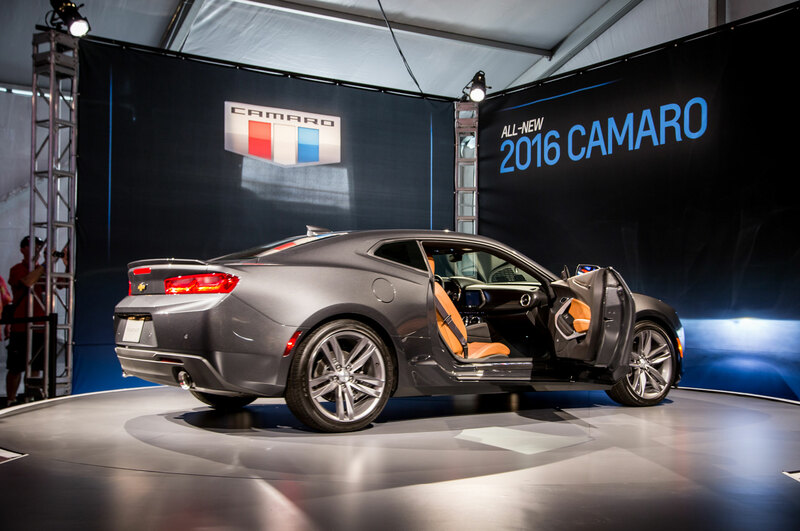 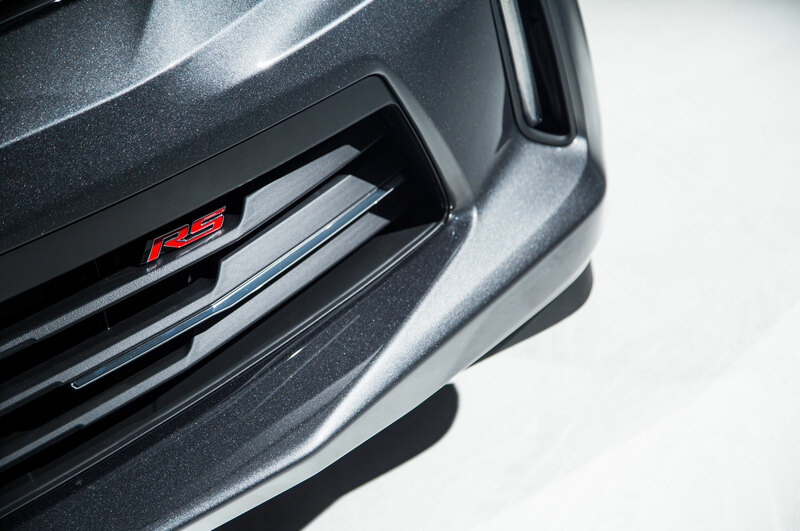 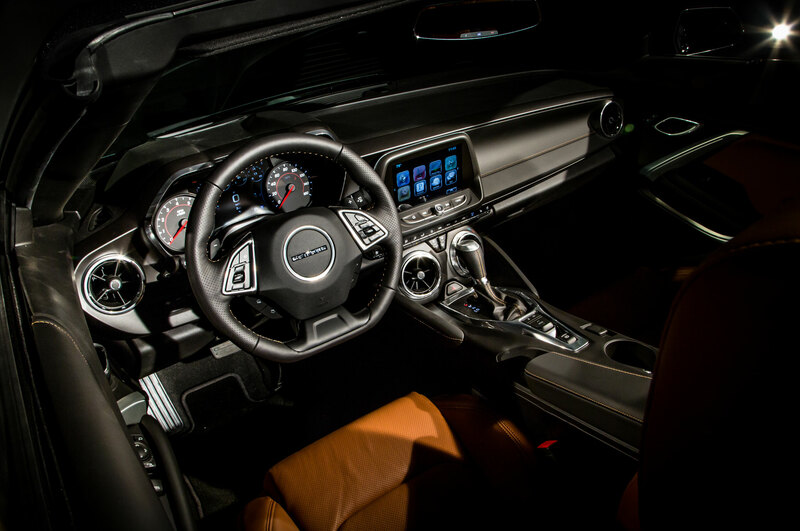 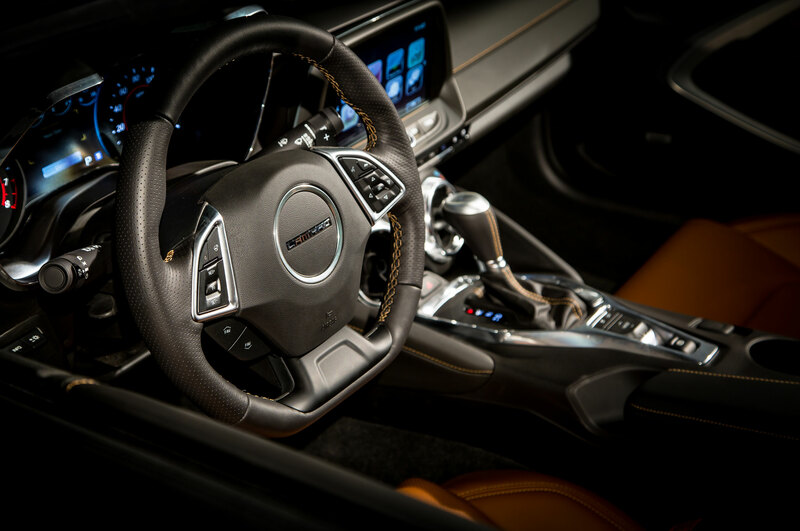 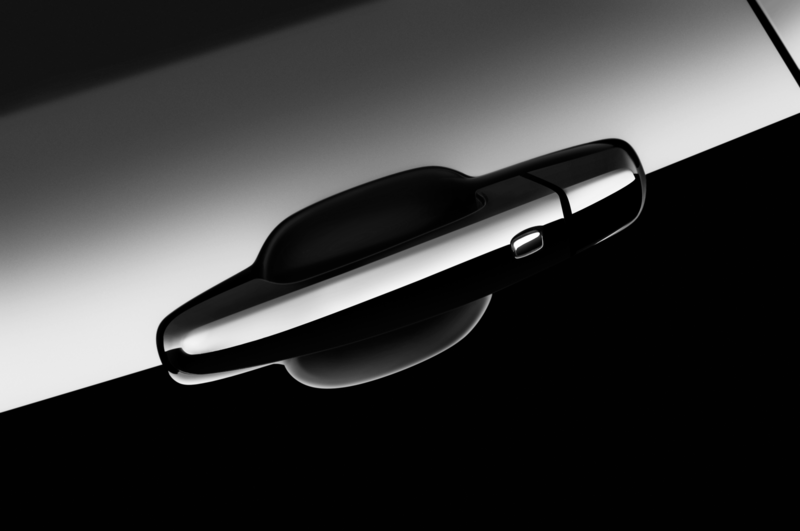 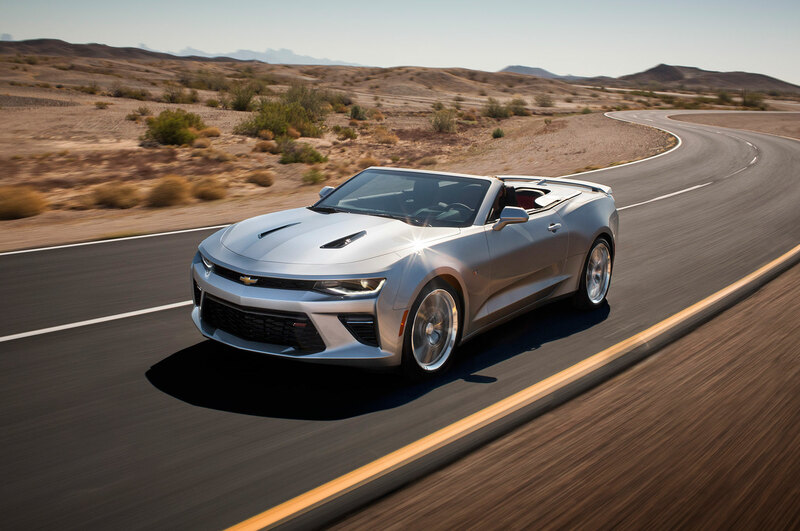 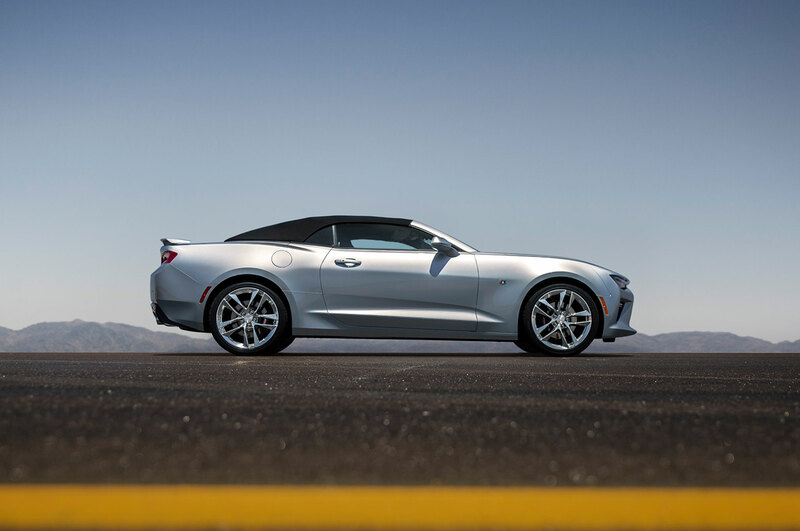 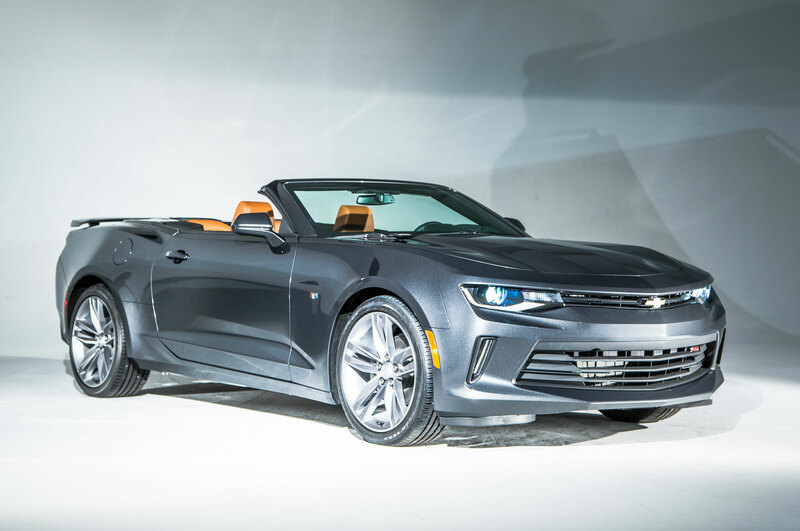 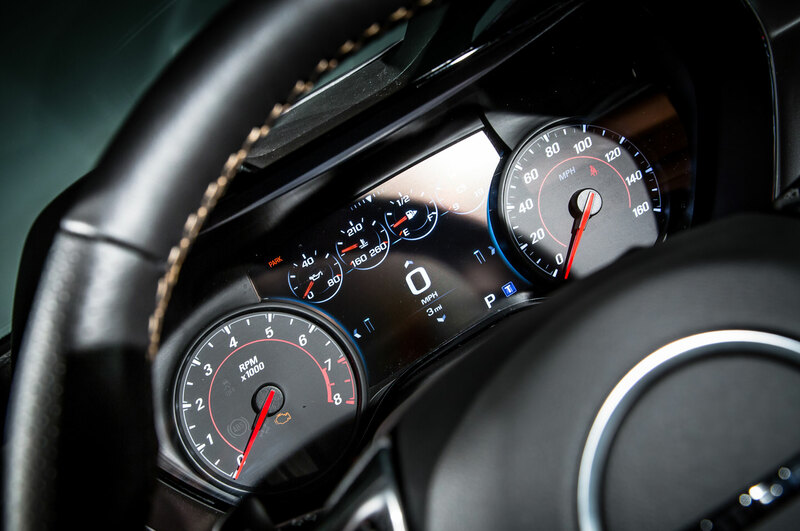 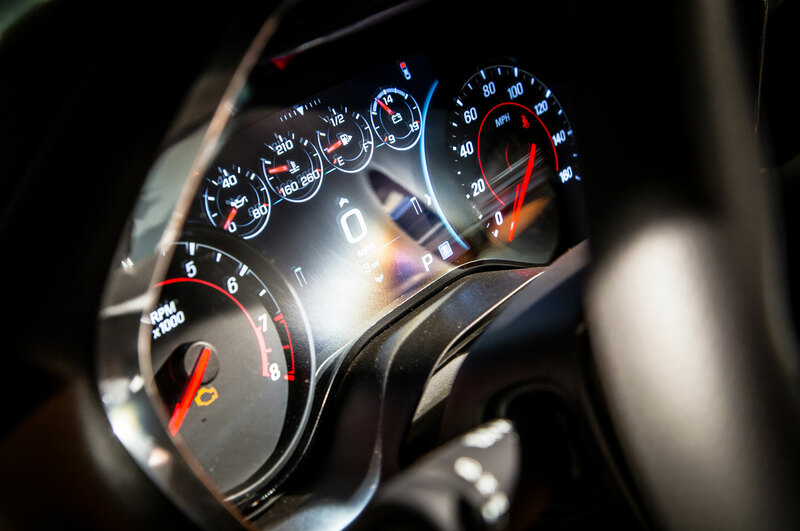 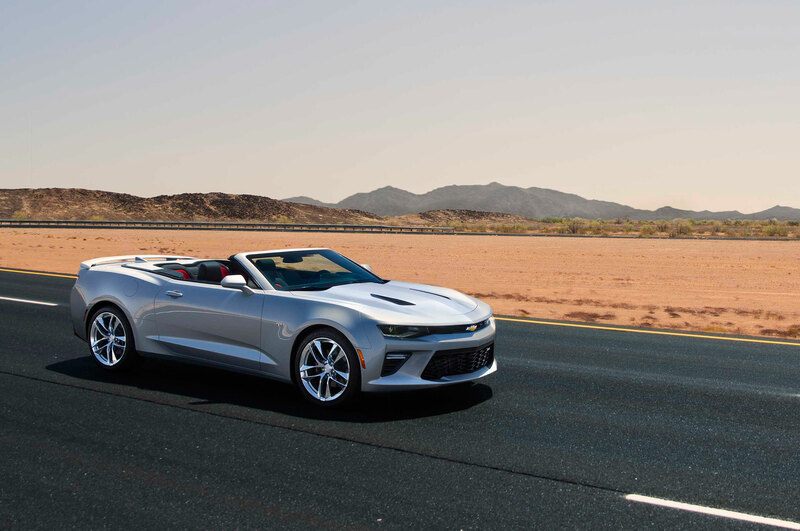 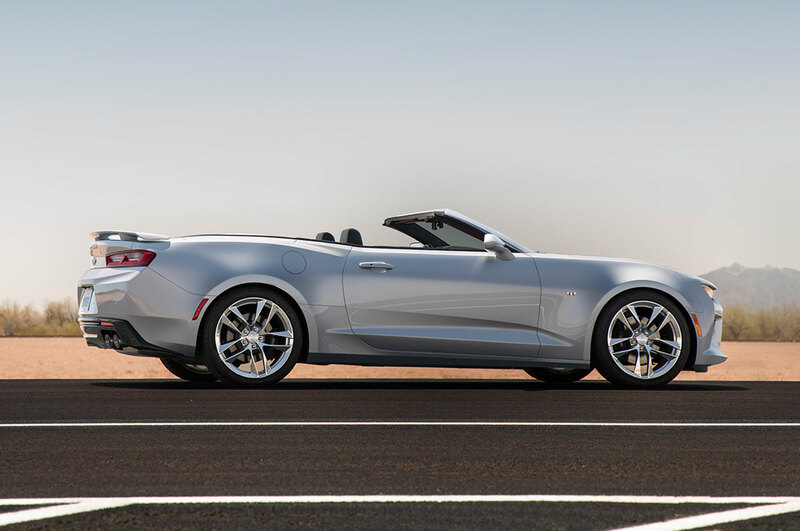 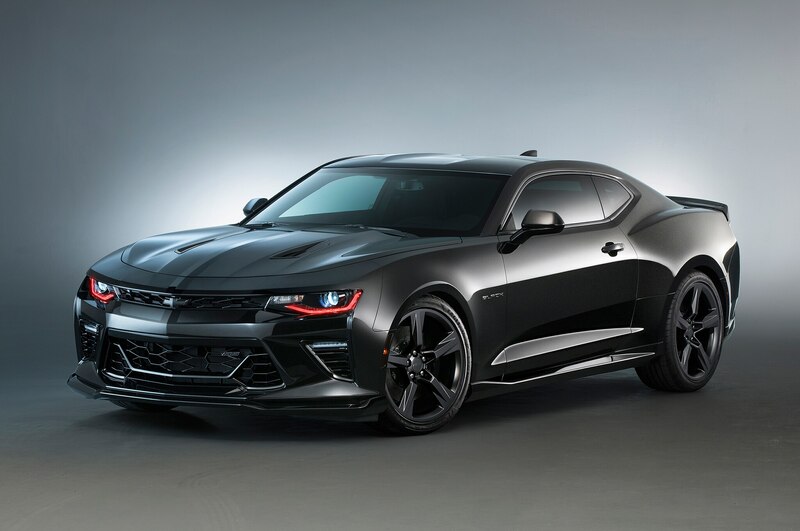 Customers will have their choice of supercharged and naturally breathing engines ranging from a 5.7-liter V-8 to a 7.0-liter V-8, or a newly available 6.2-liter V-8. 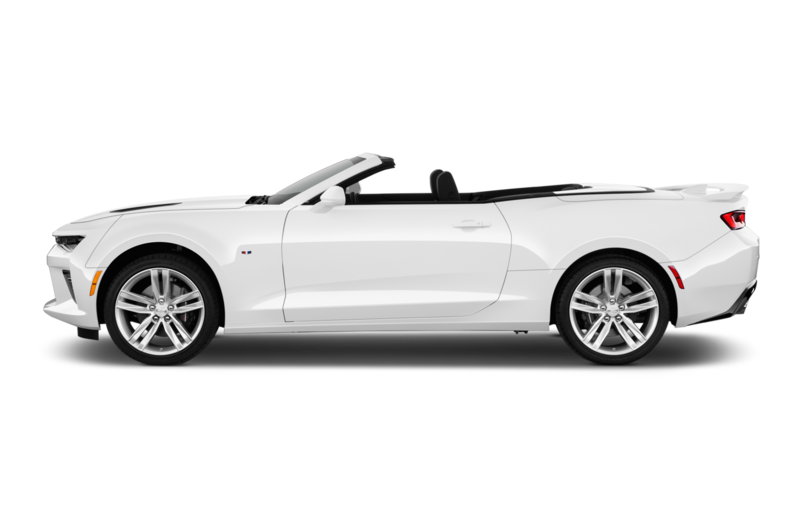 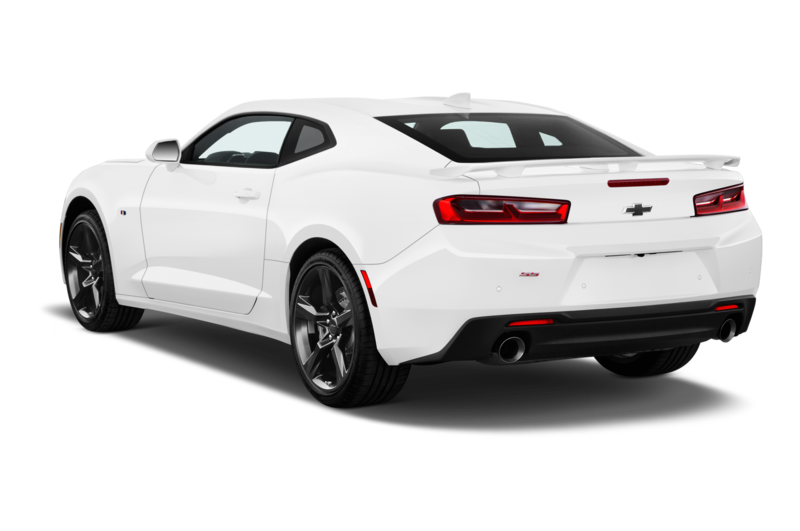 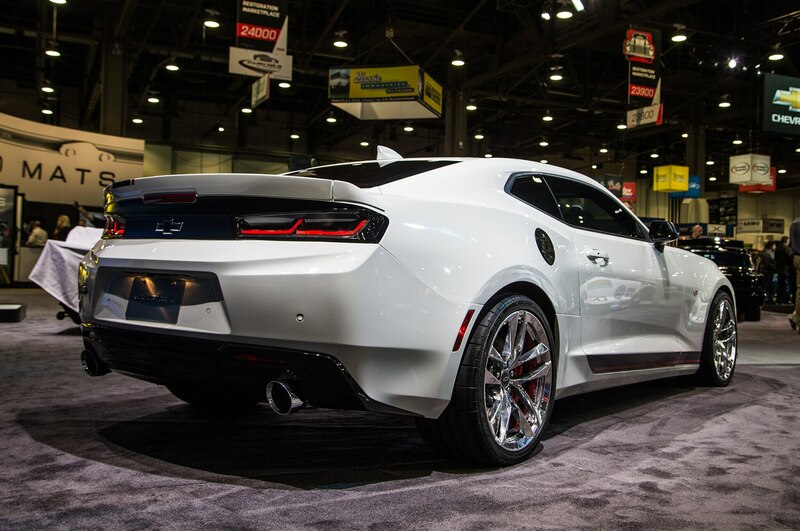 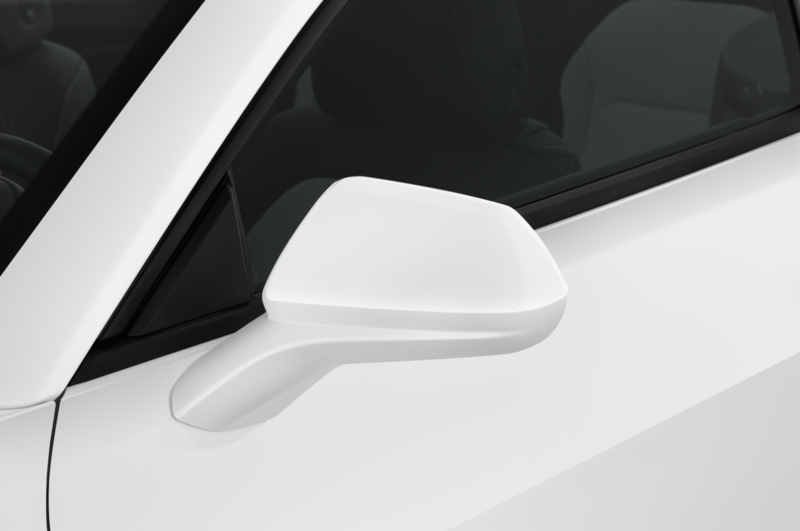 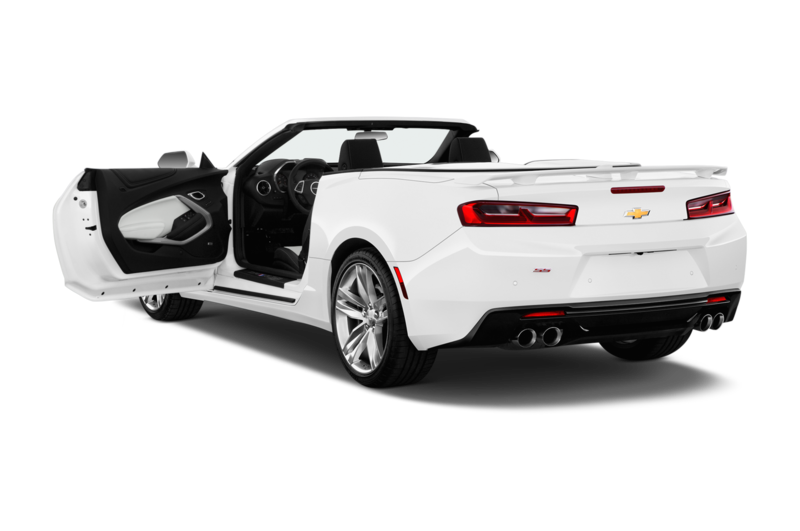 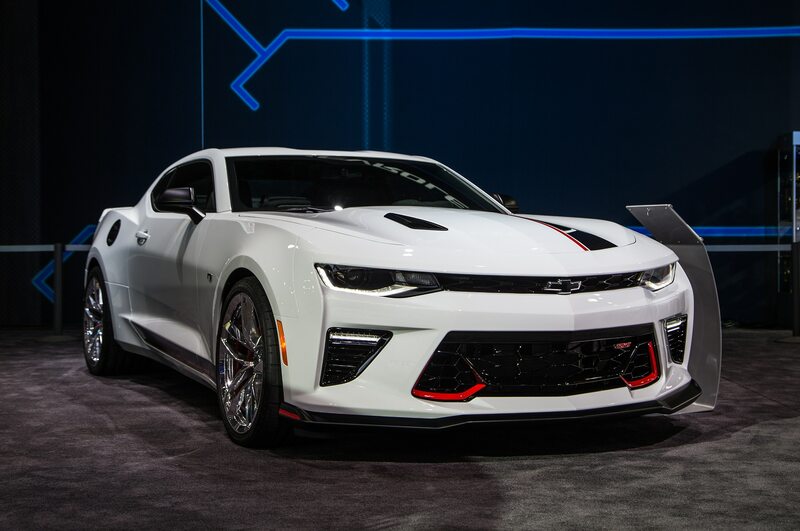 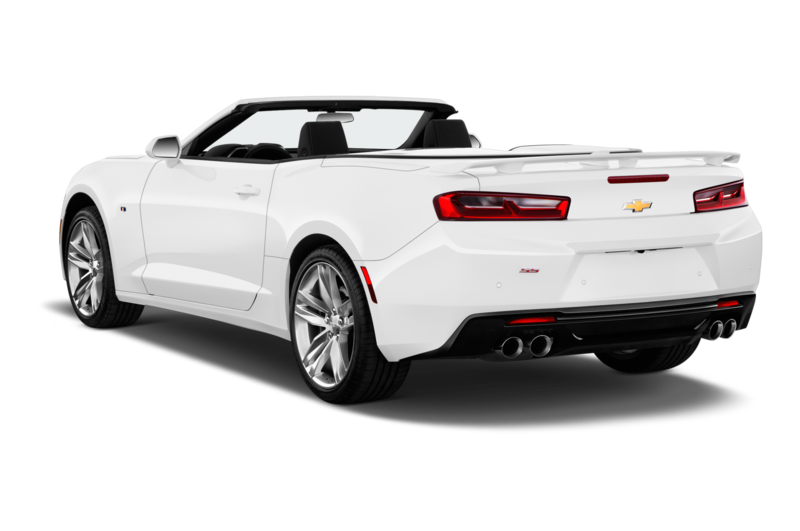 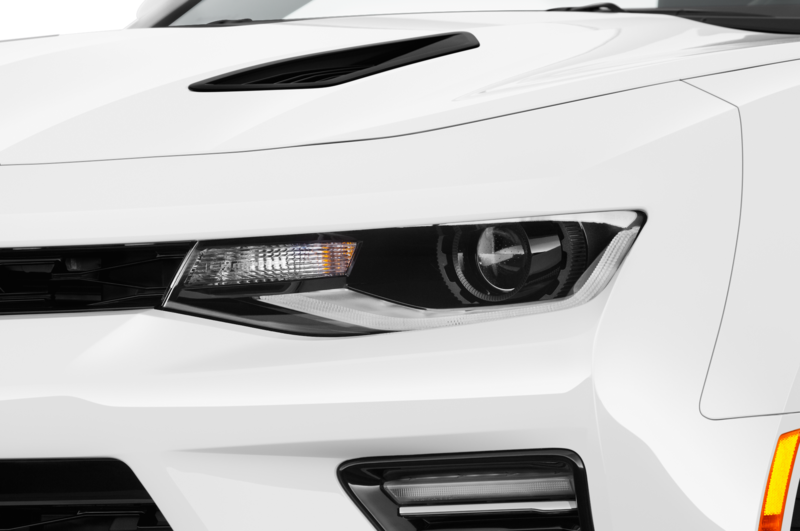 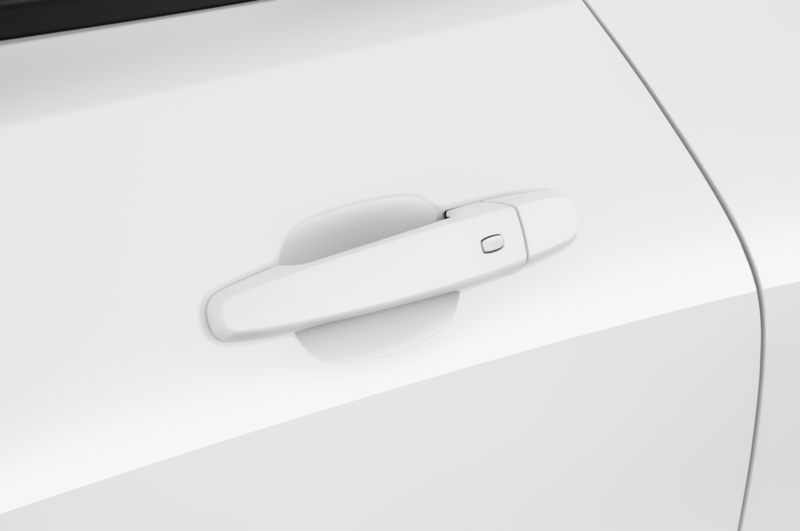 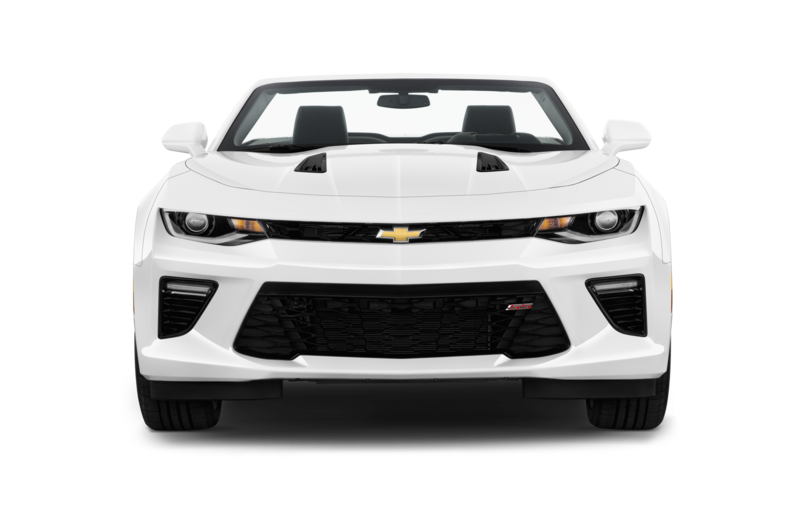 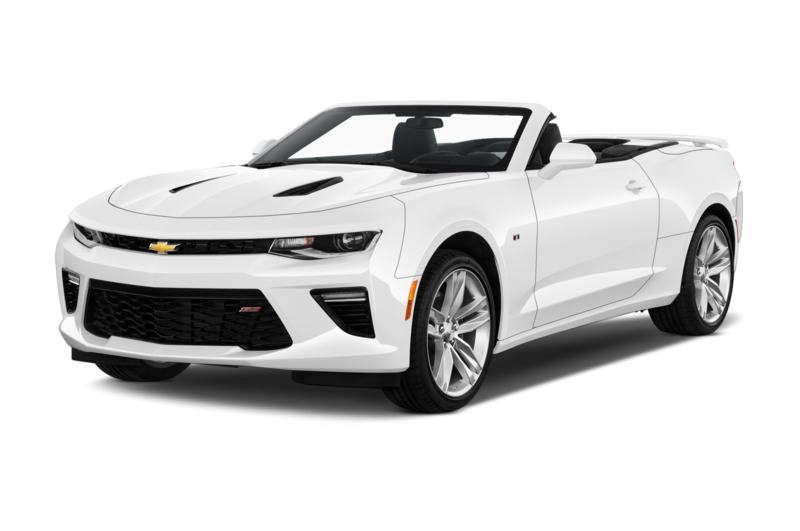 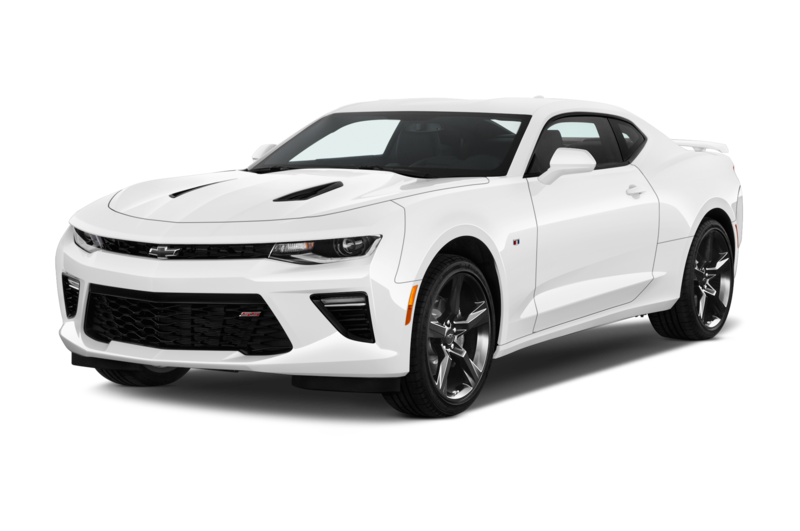 This Summit White 2016 Chevrolet Camaro SS is more than just a pretty face, although it is pretty. 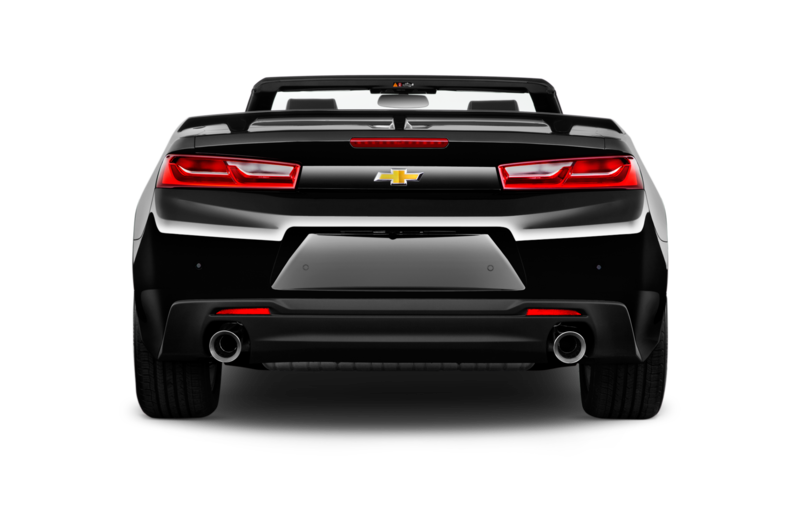 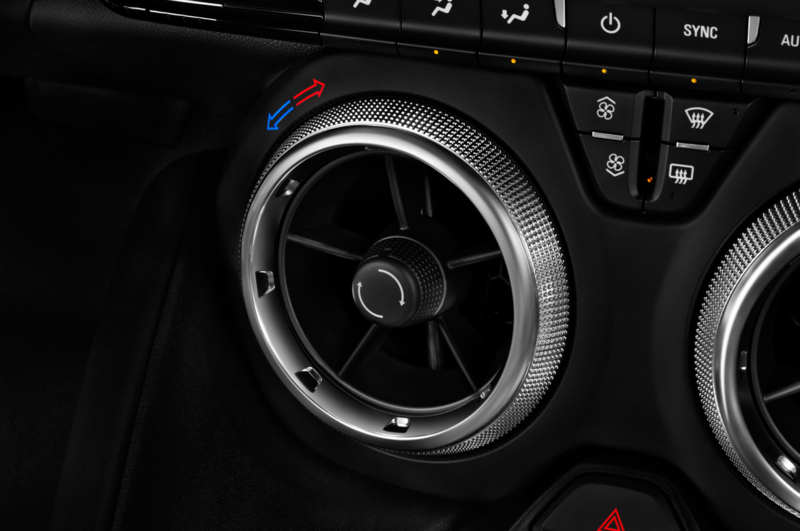 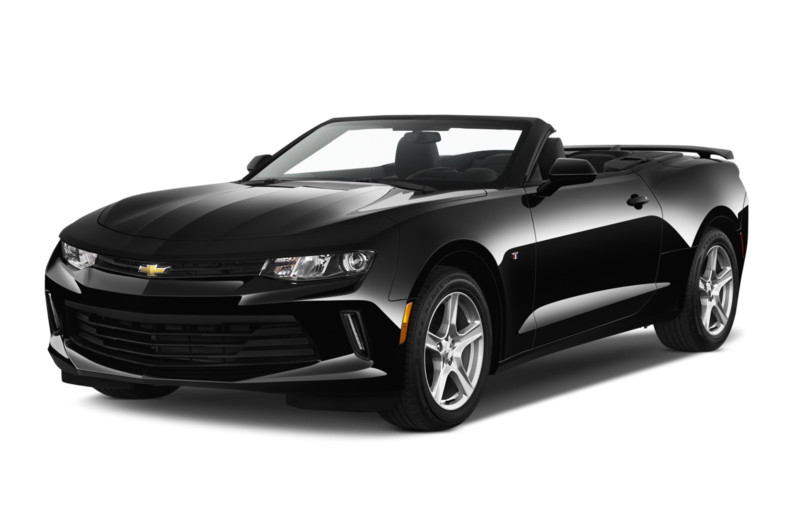 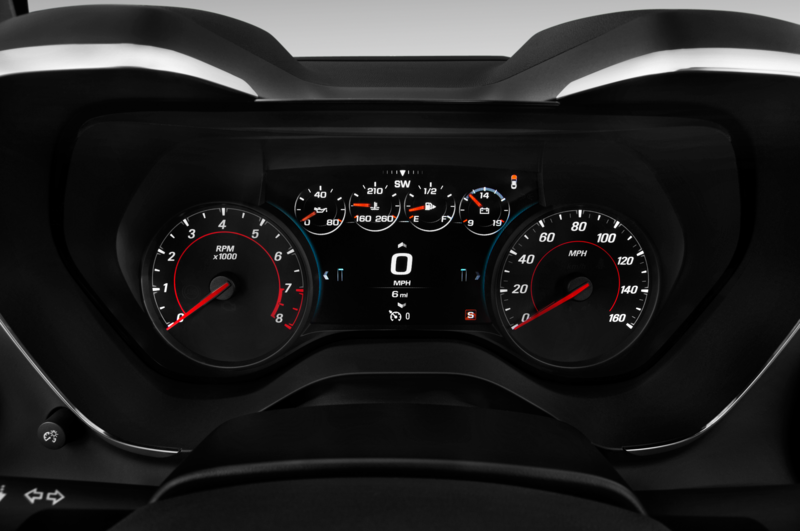 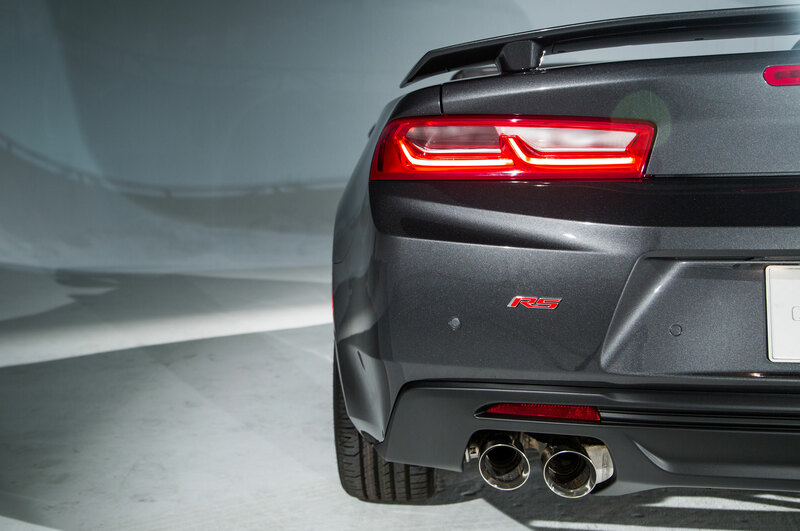 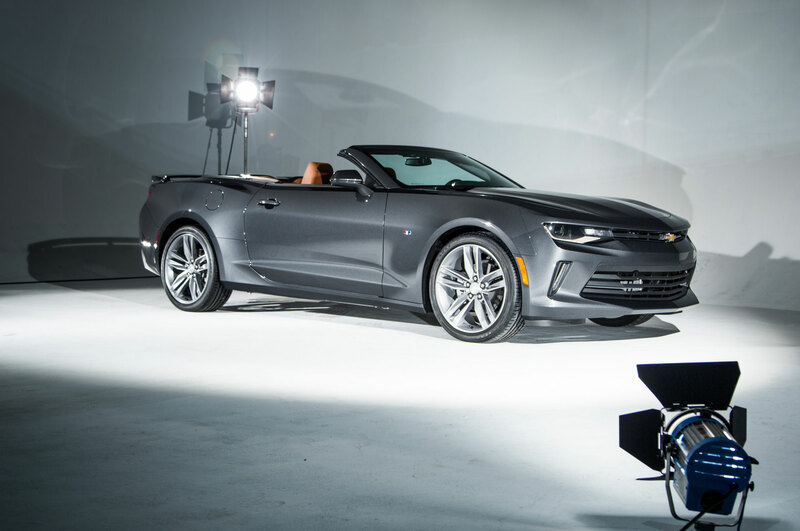 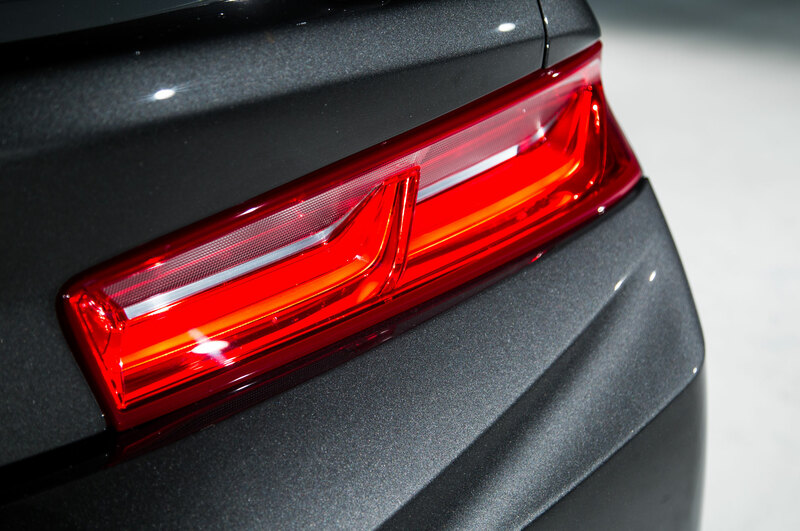 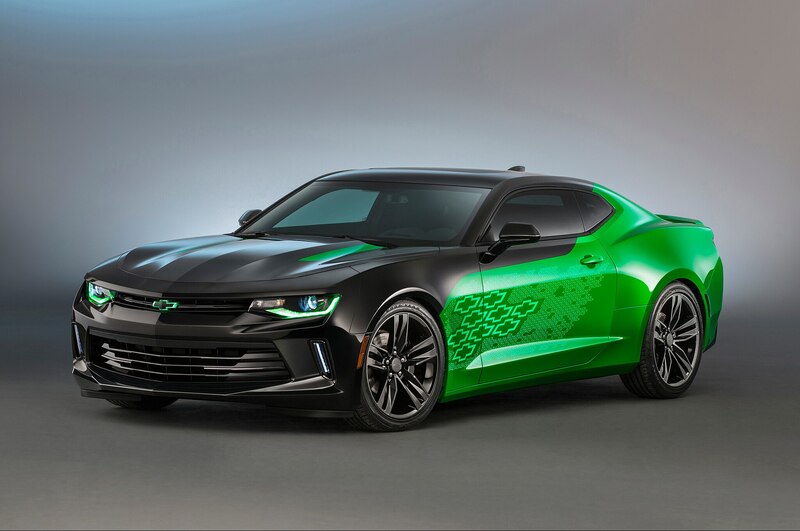 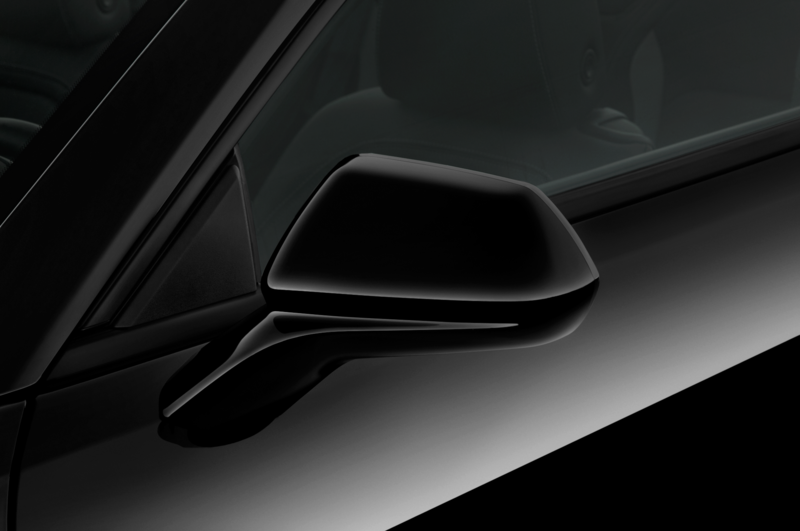 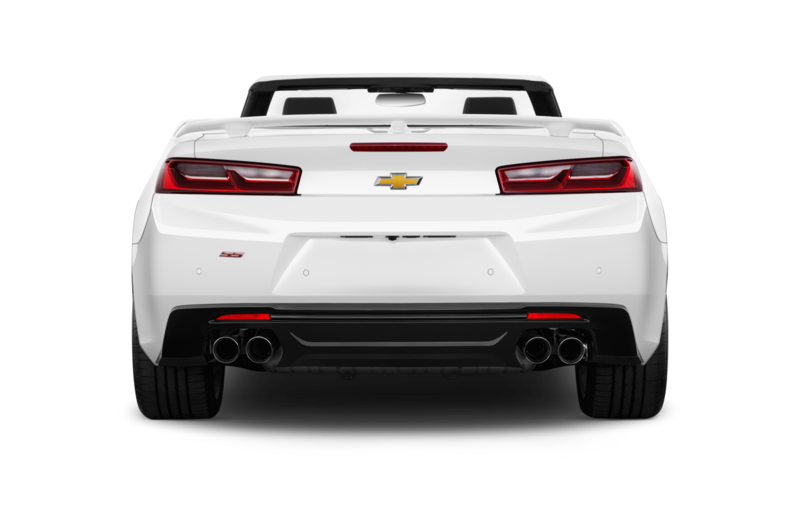 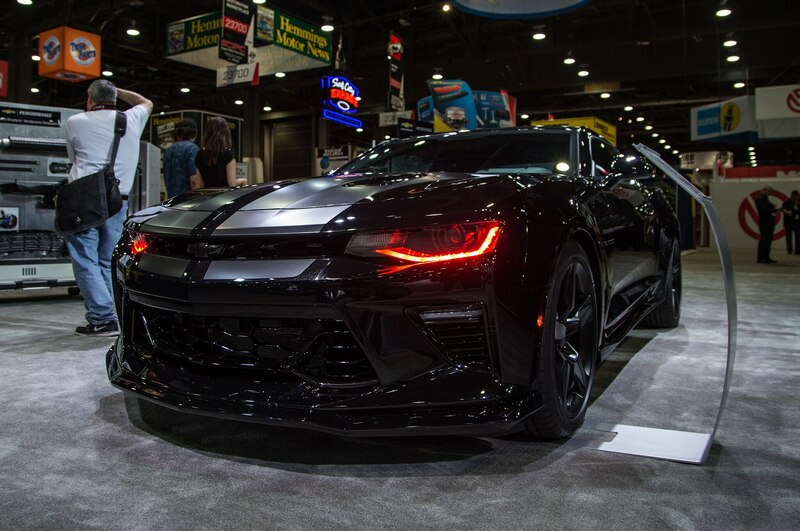 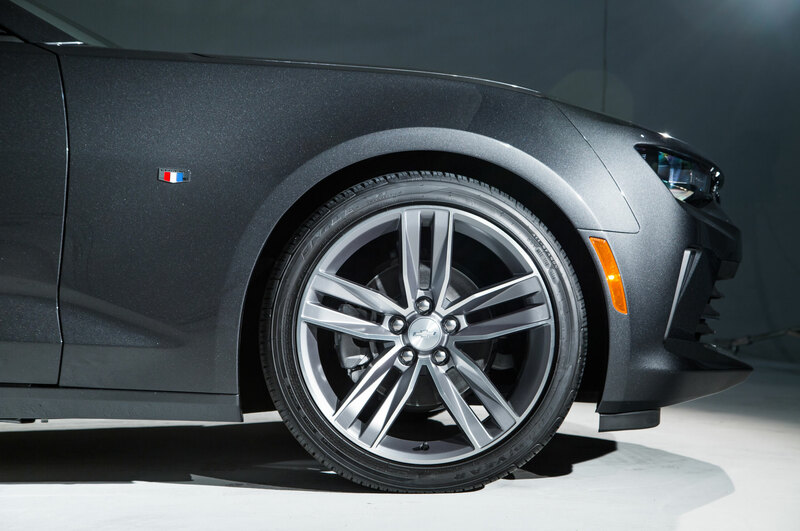 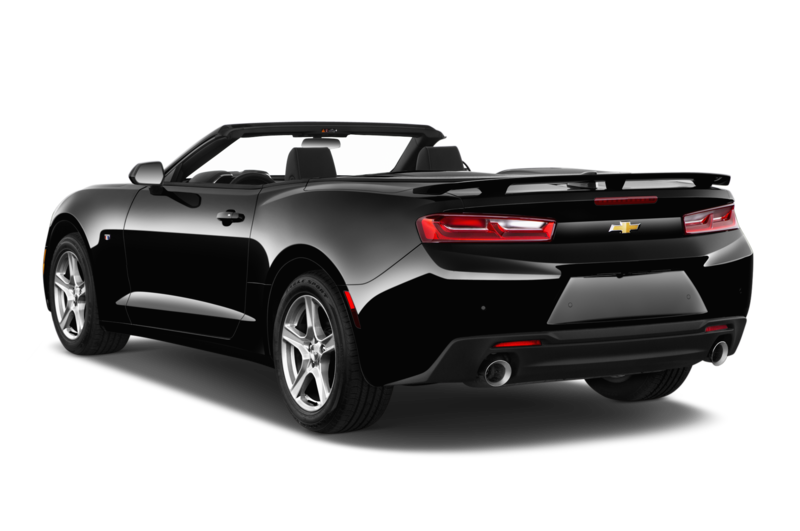 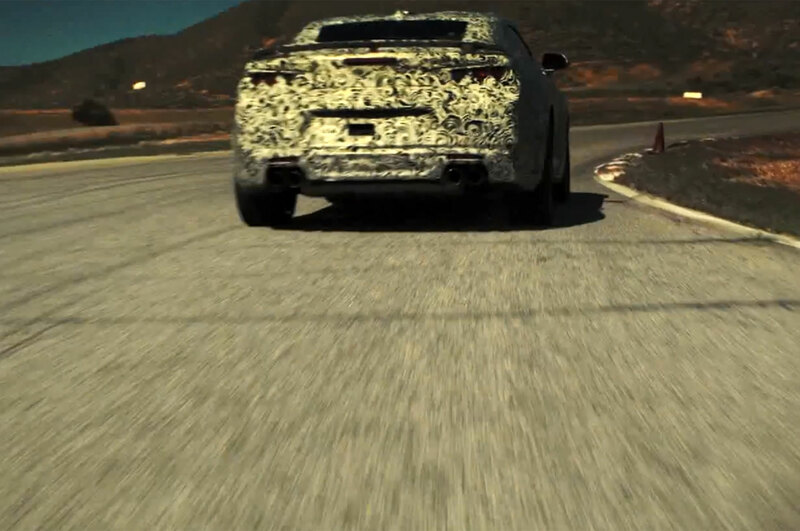 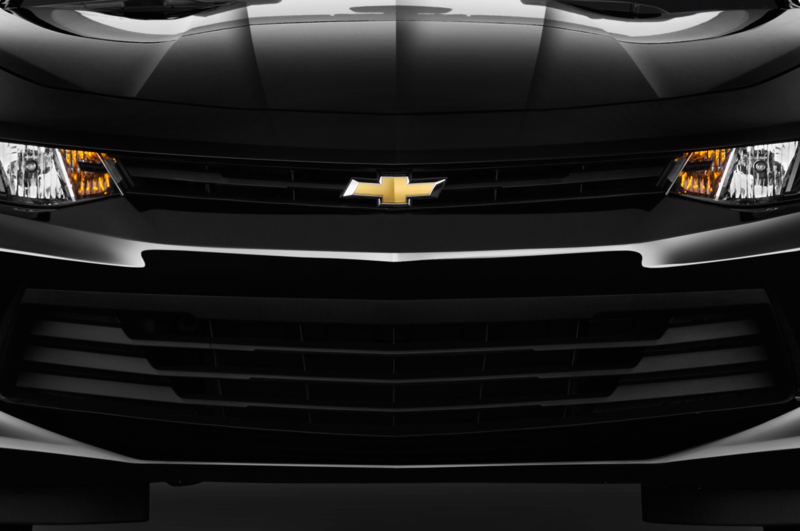 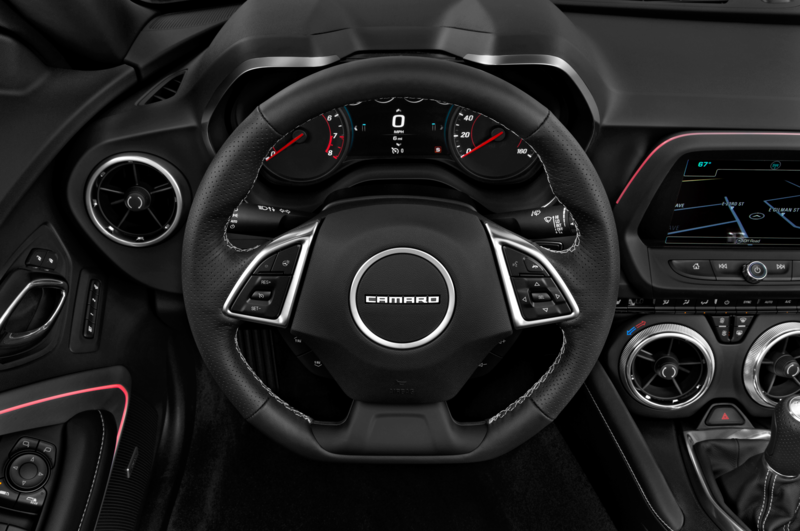 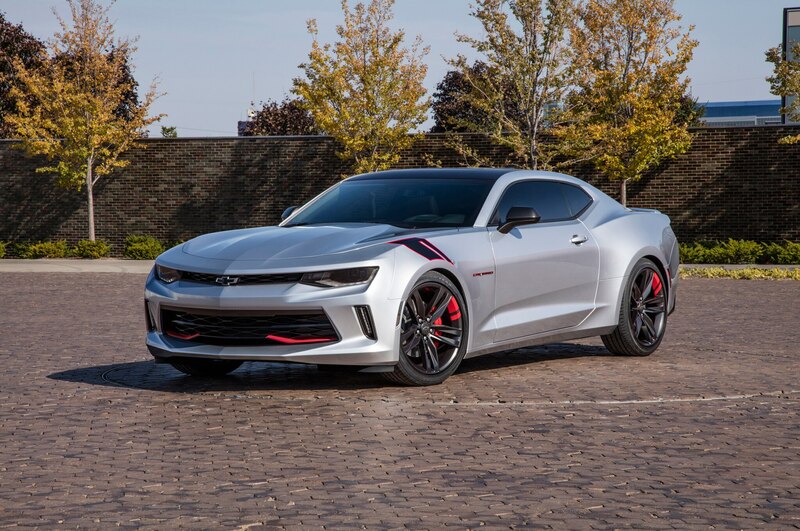 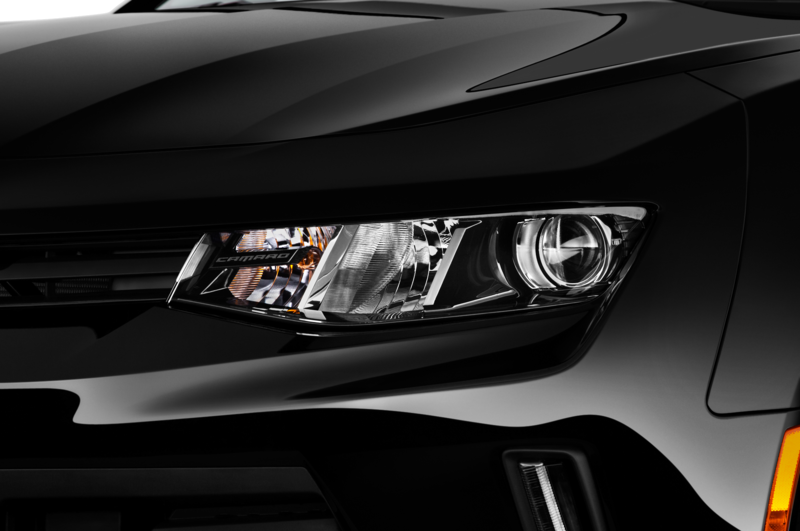 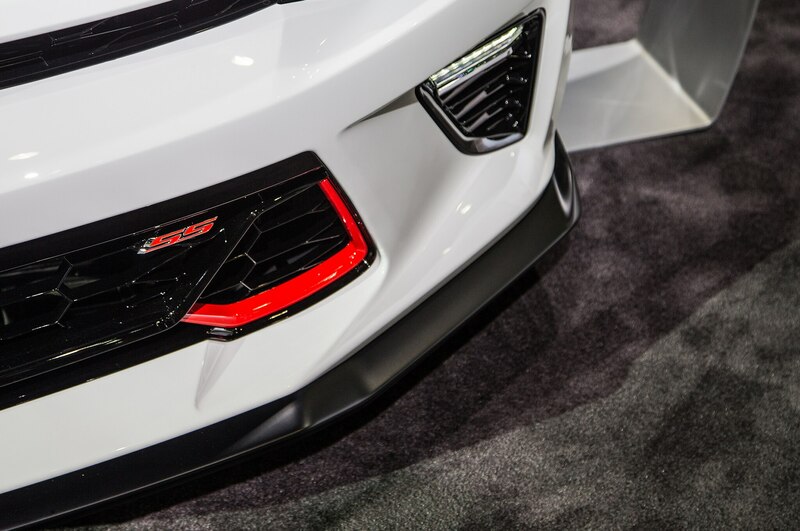 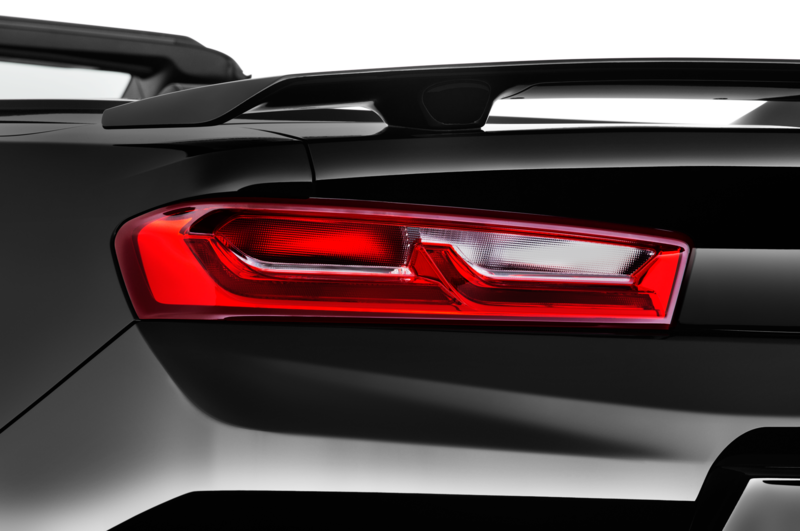 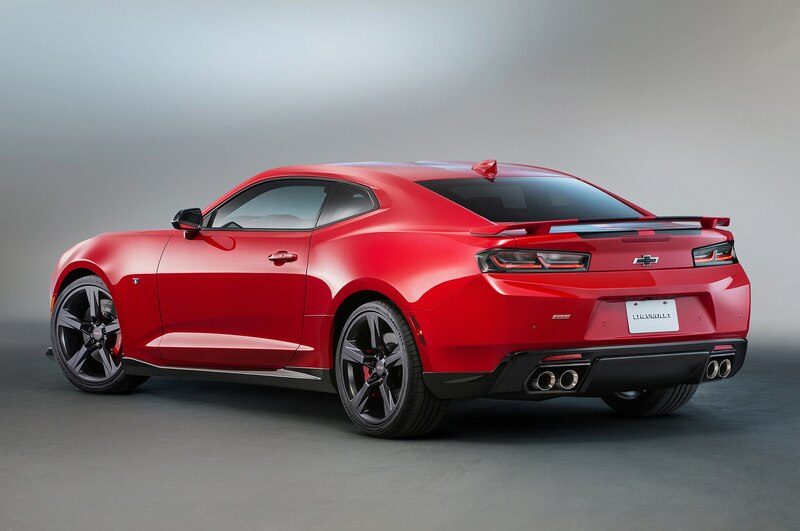 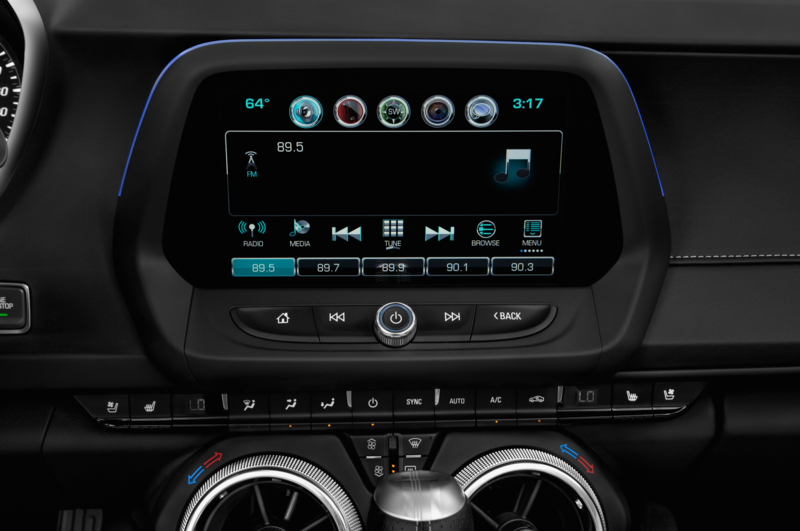 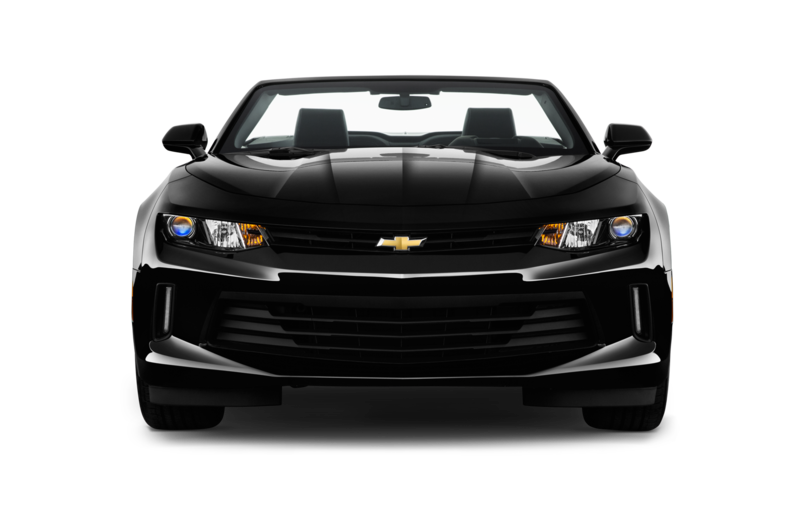 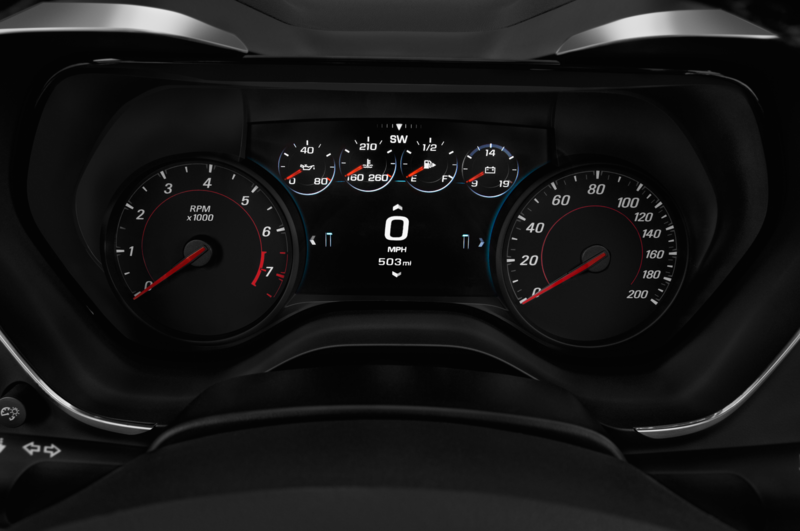 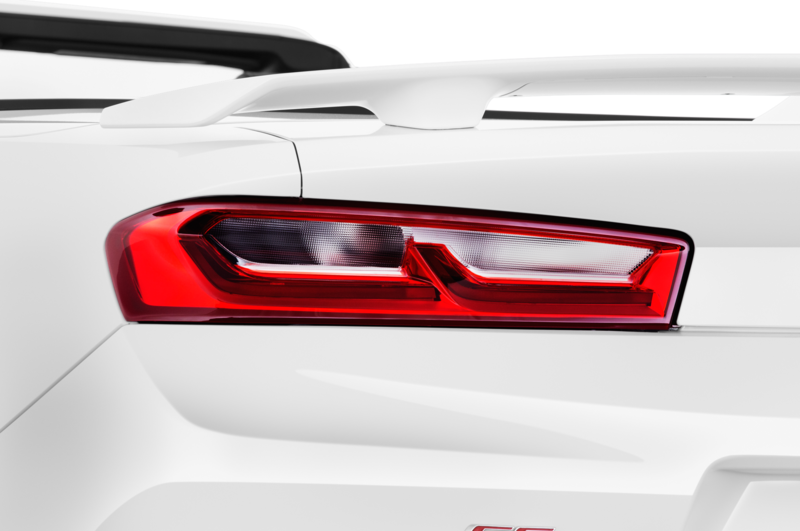 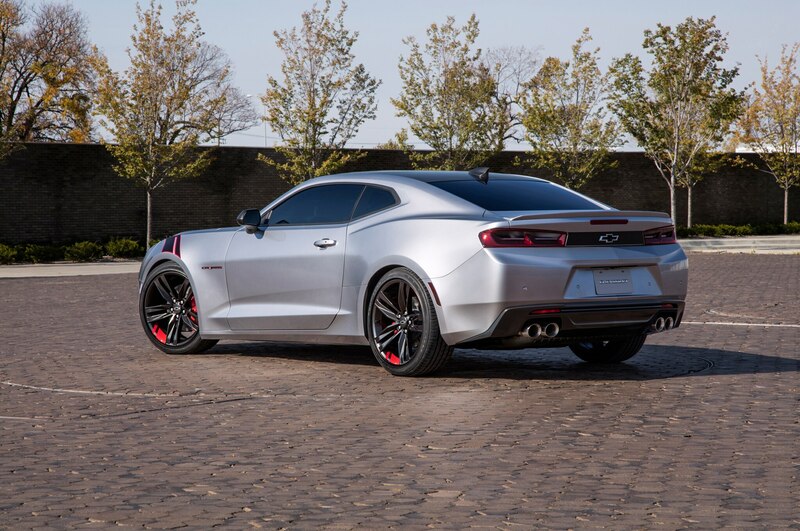 In addition to the Chevrolet Performance stripe graphics, blacked-out rear-end panel, front and rear aerodynamic body upgrades, unique 20-inch wheels, and black bowtie emblems, the Camaro Chevrolet Performance Concept has tantalizing performance mods. 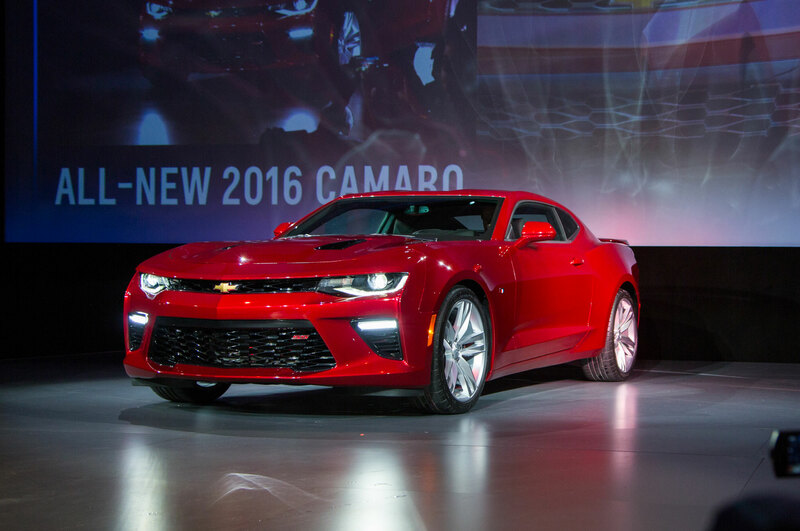 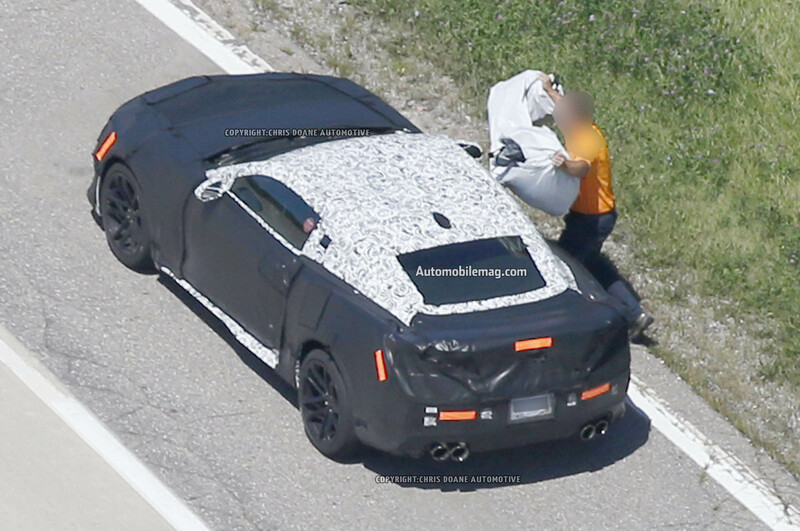 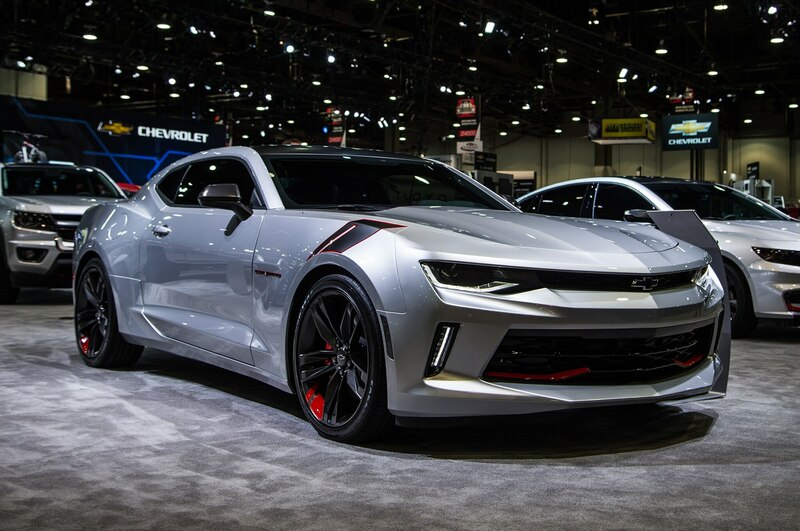 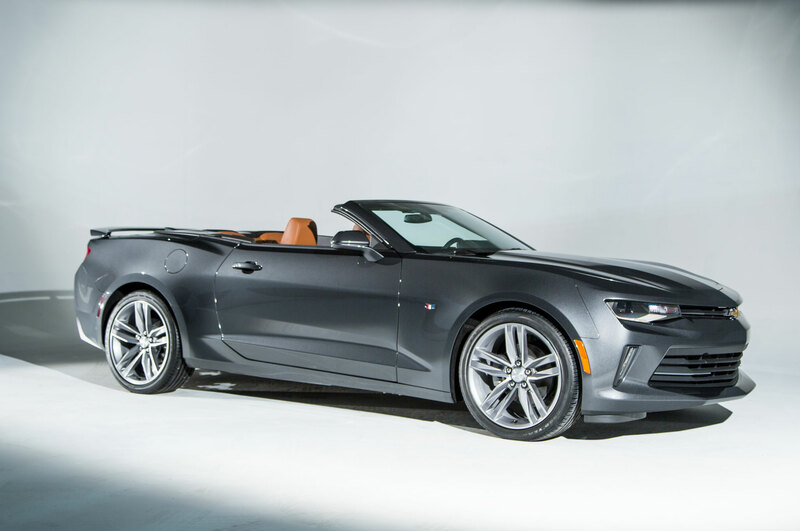 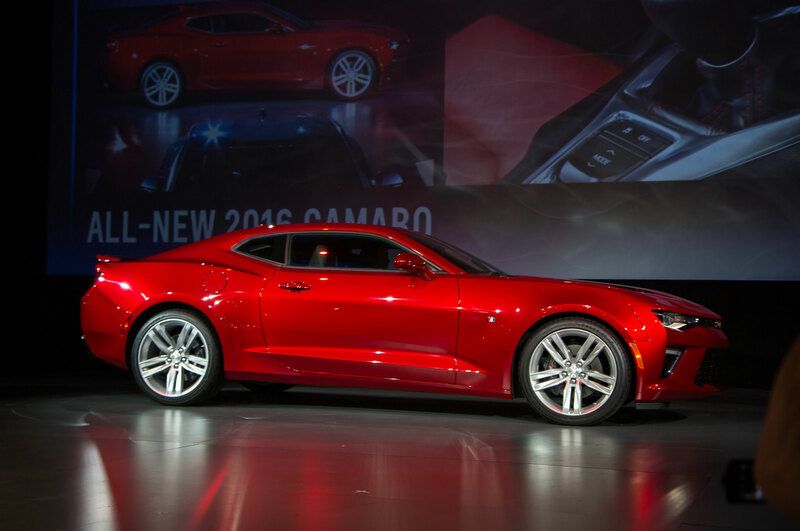 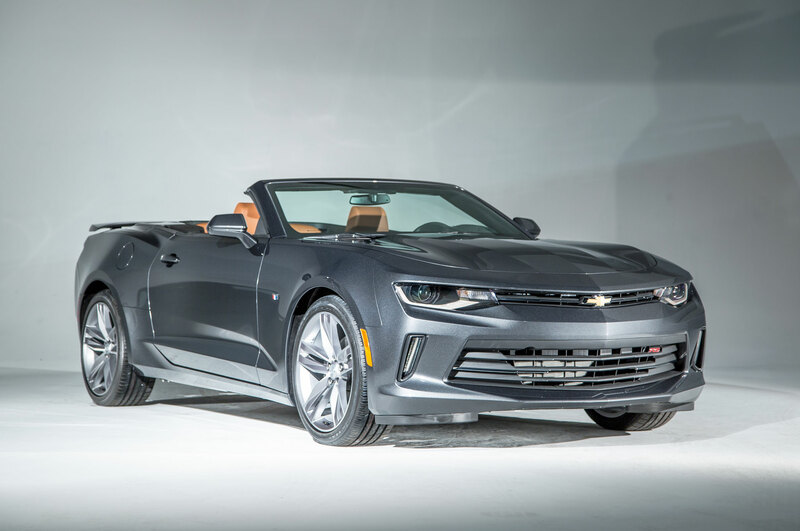 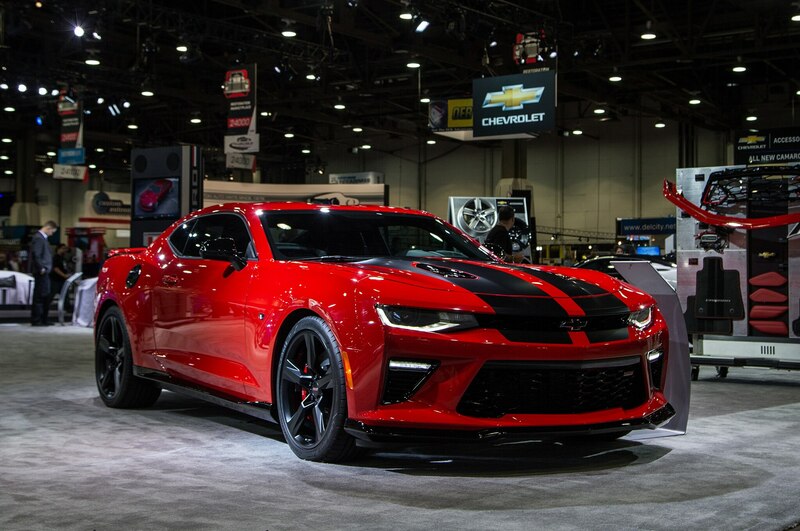 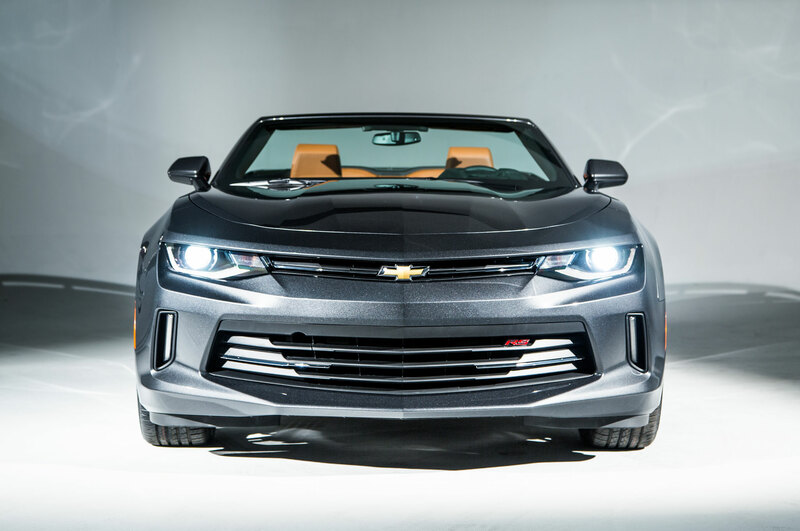 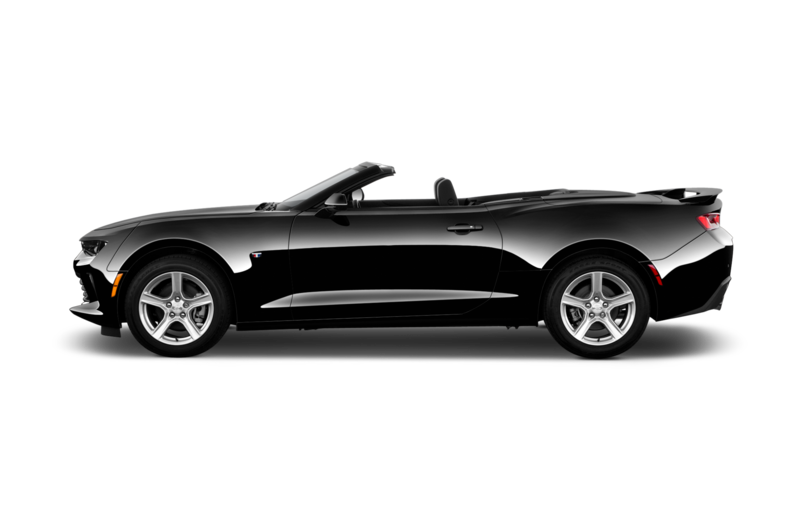 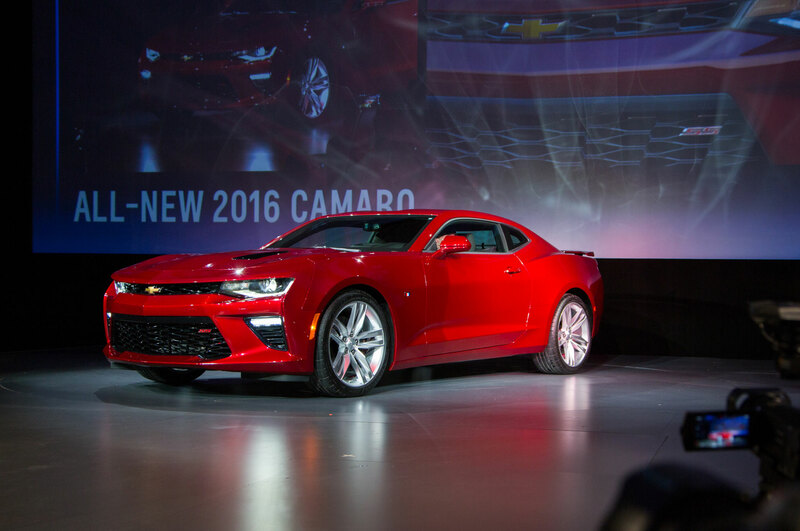 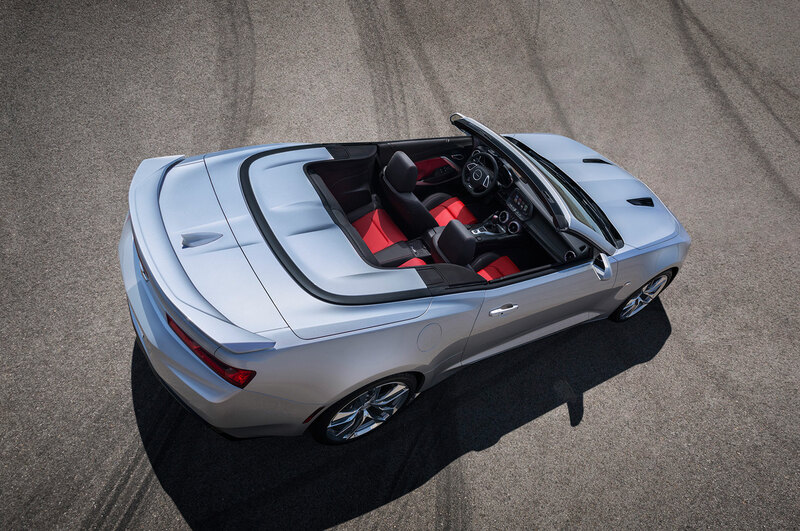 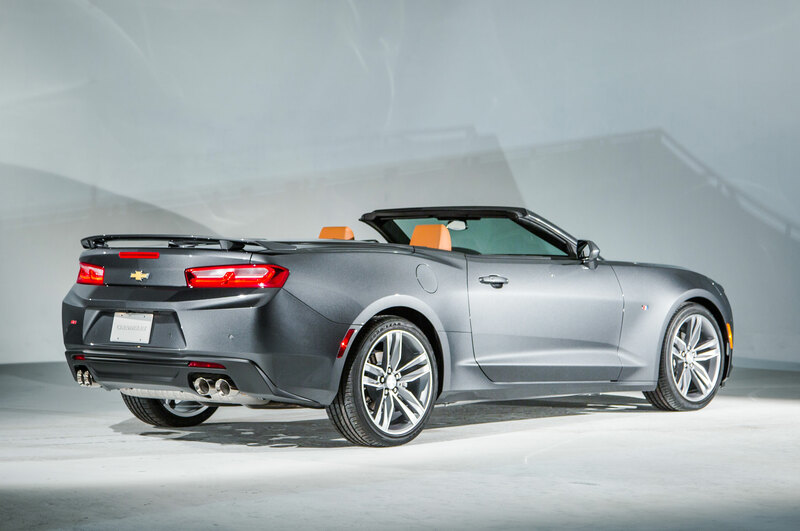 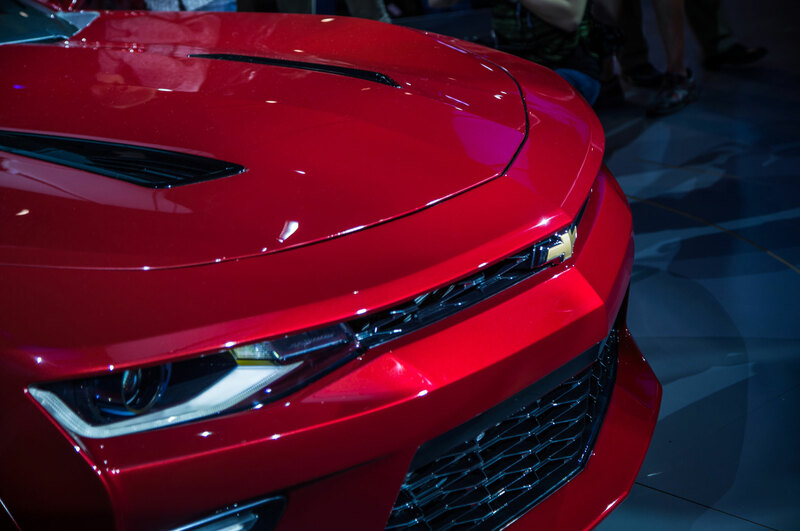 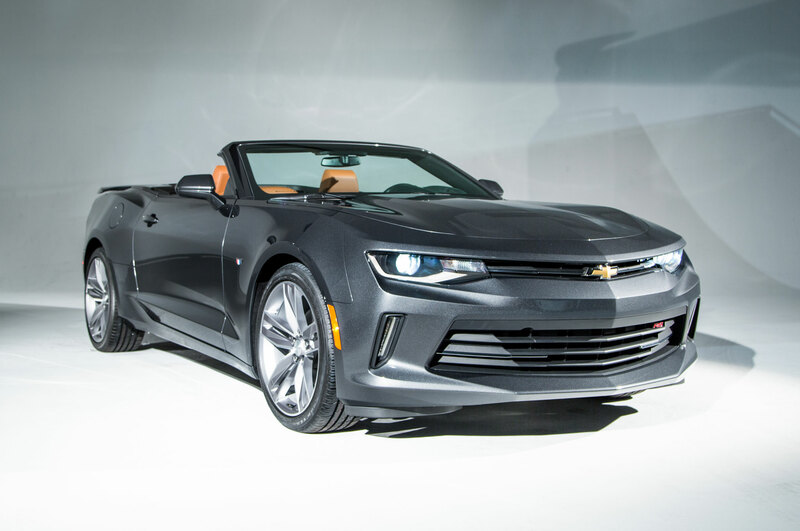 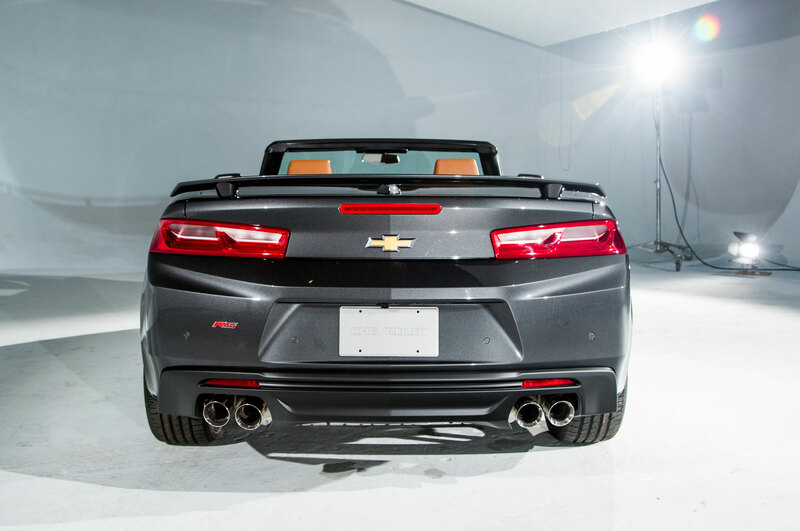 The 6.2-liter LT1 V-8 gets a performance air intake, exhaust system upgrade, and red engine cover. 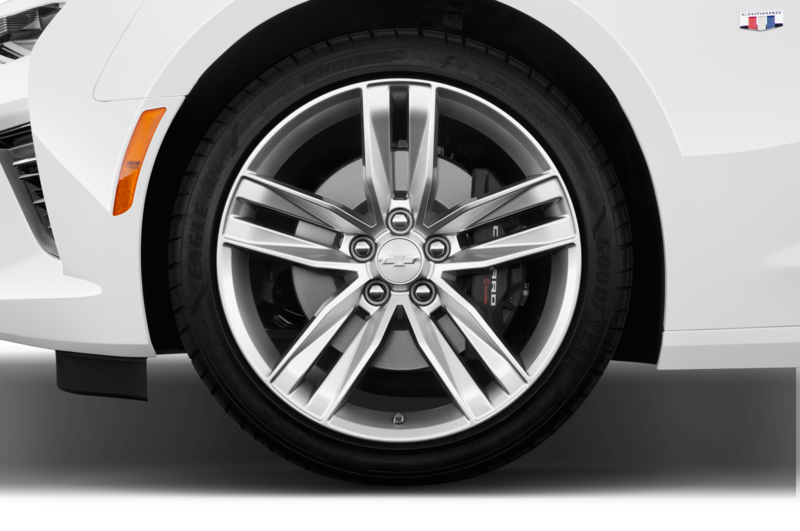 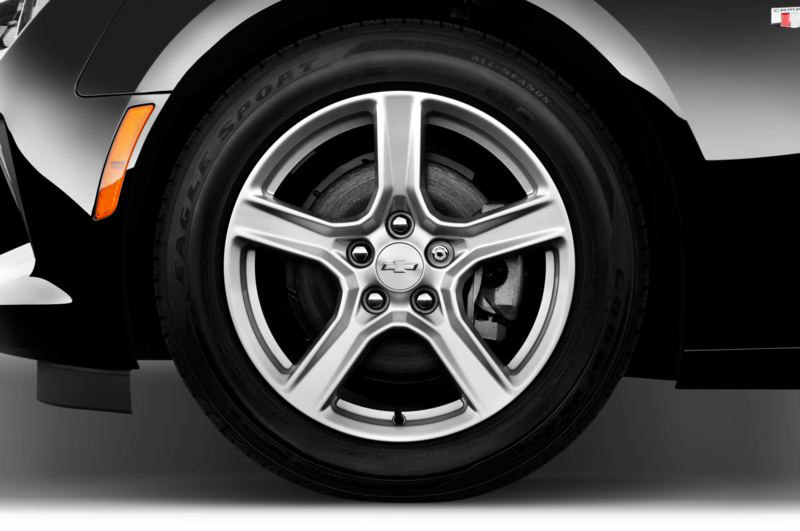 The suspension is lowered, and Brembo front brakes with six-piston calipers replace the stock stoppers. 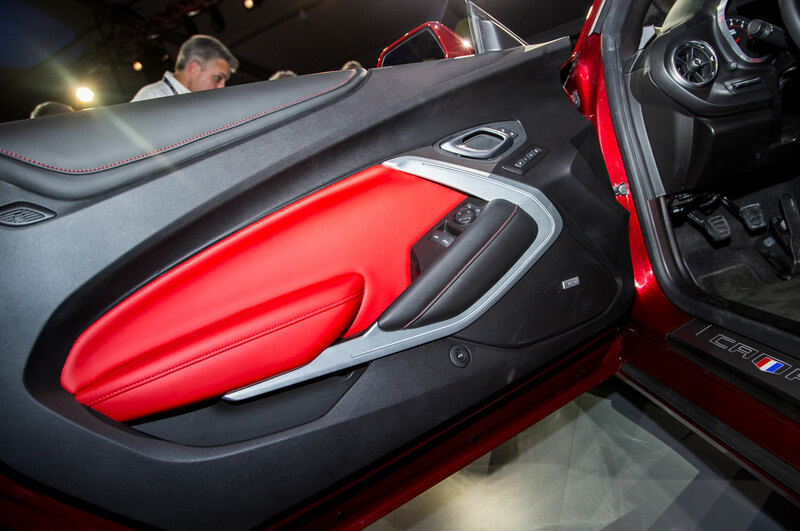 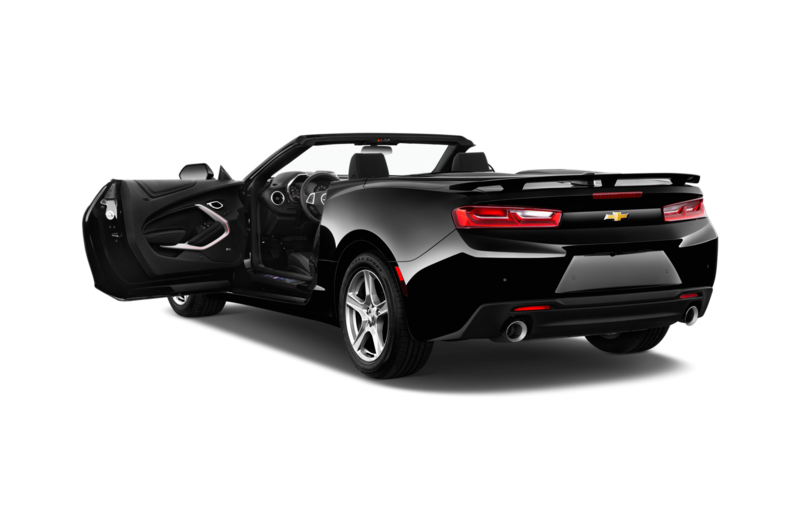 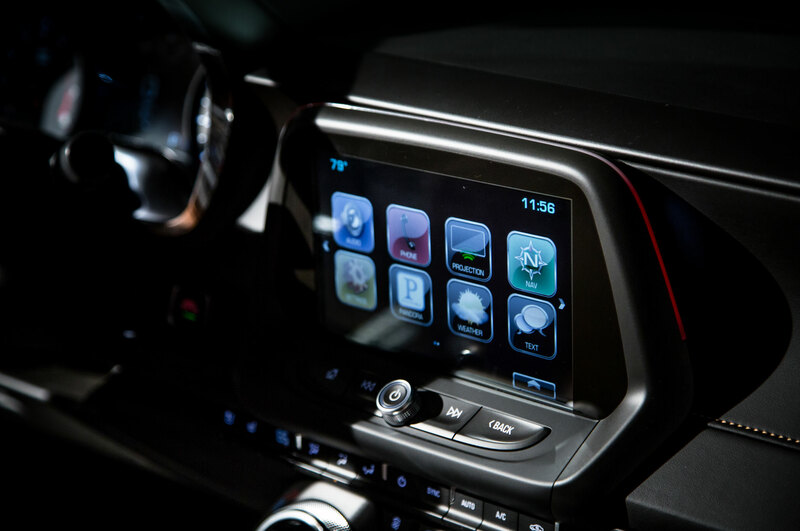 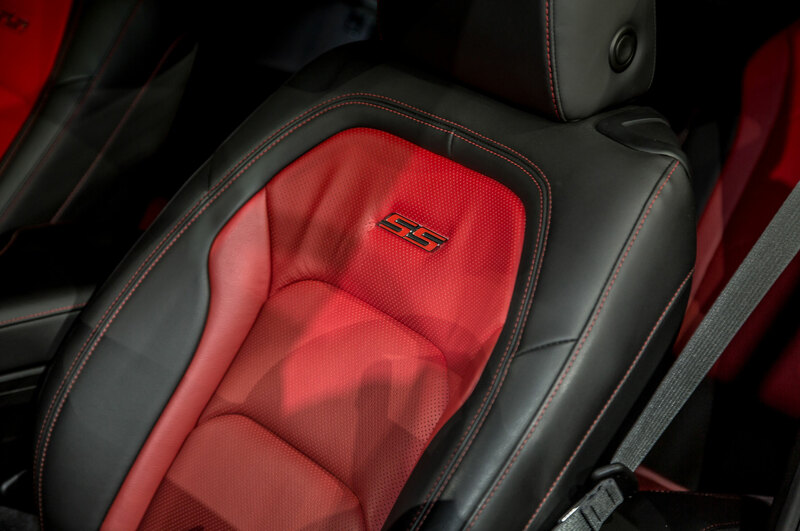 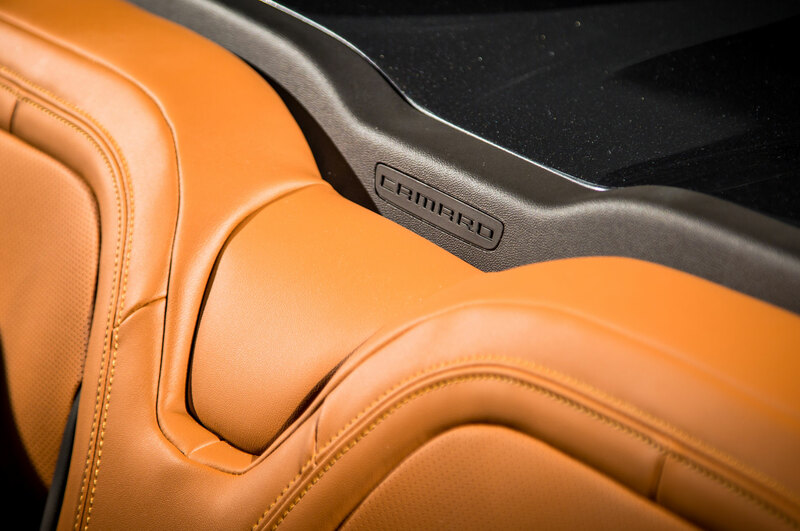 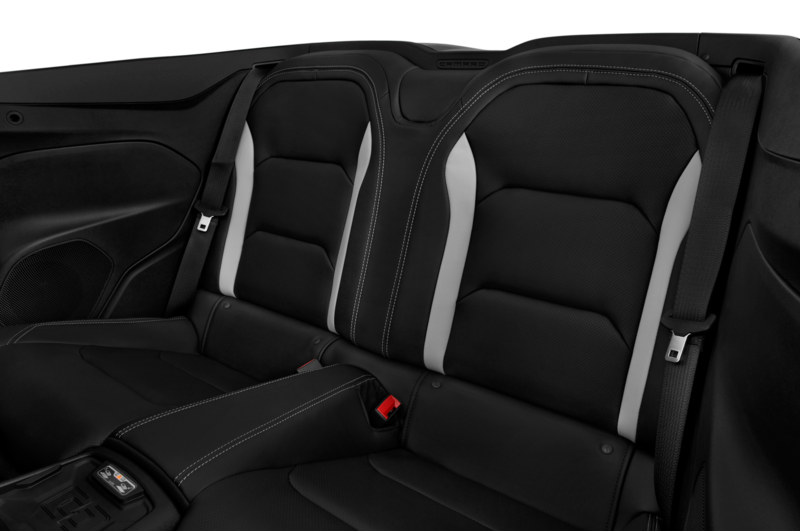 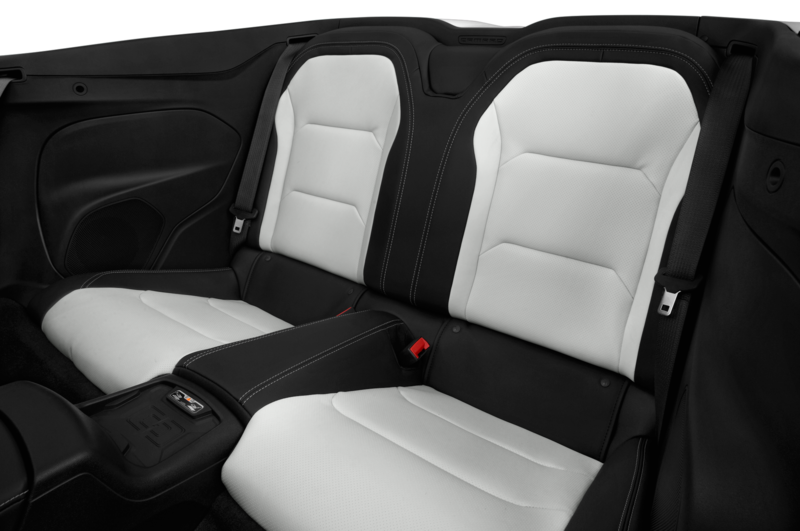 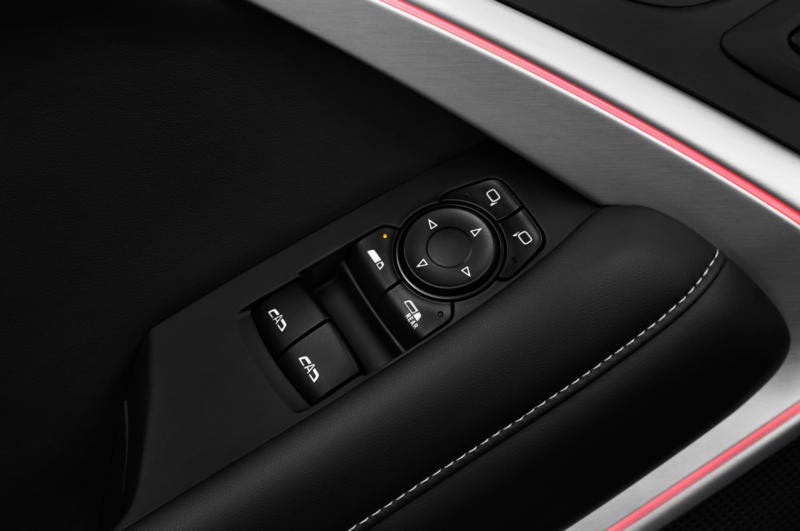 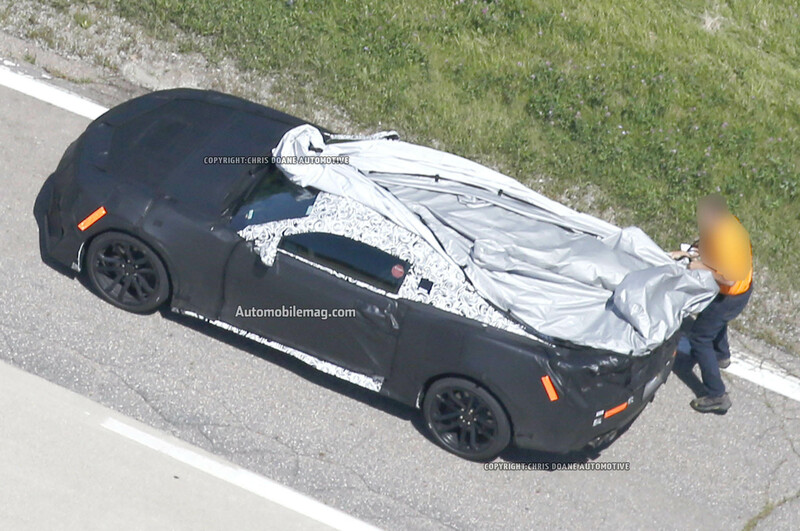 Inside is an attractive combination of red and black color cues in leather and suede, all dotted with Chevrolet Performance logos. 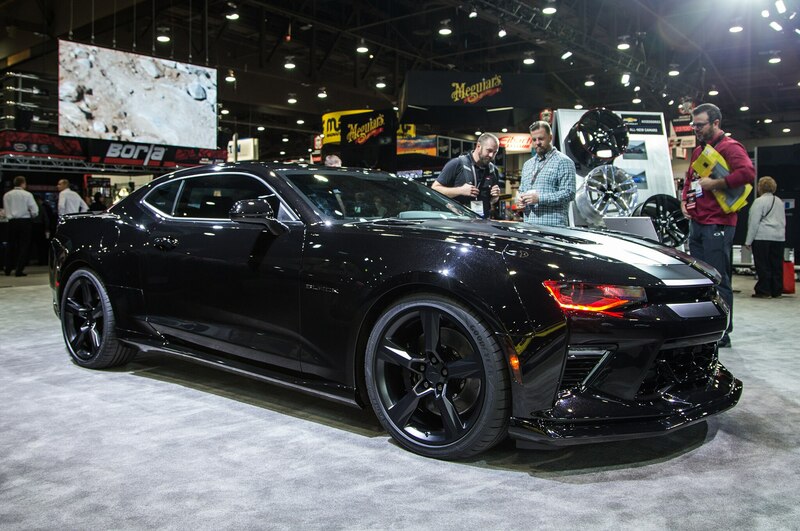 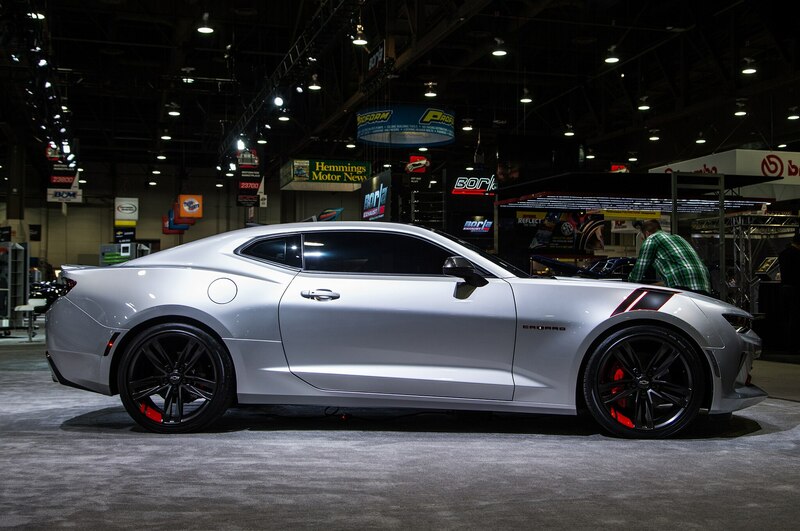 Check out the gallery below for more Chevrolet Camaro concepts at SEMA, including Hyper, Krypton, and Black versions.